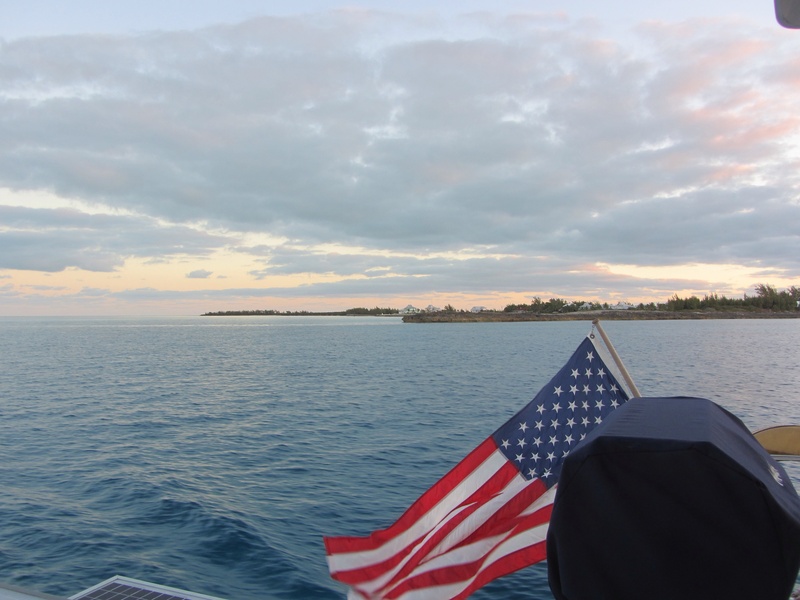 On December 23, 2018, we left Bimini Sands Marina at 0530, in the dark. There was a full moon but we still needed a spotlight to get out of the narrow marina channel and then into the channel that is the exit to the Atlantic Ocean from North and South Bimini. Turning south, we were on deep ocean water for one hour before we got onto the shallow Bank. We arrived at Chub Cay at 1729, after 12 hours of motorsailing and in daylight. The last hour of the day we were in the Northwest Channel, which is deep ocean water. 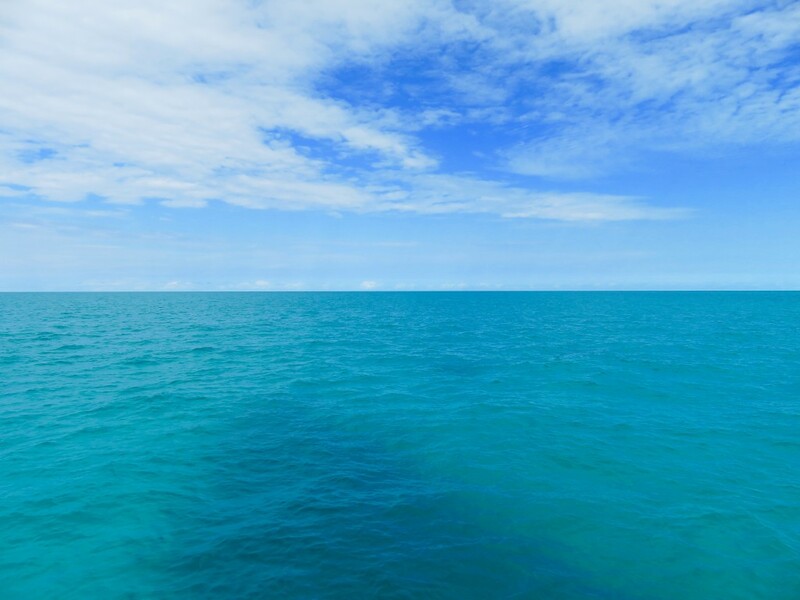 The seas were fairly flat most of the day. 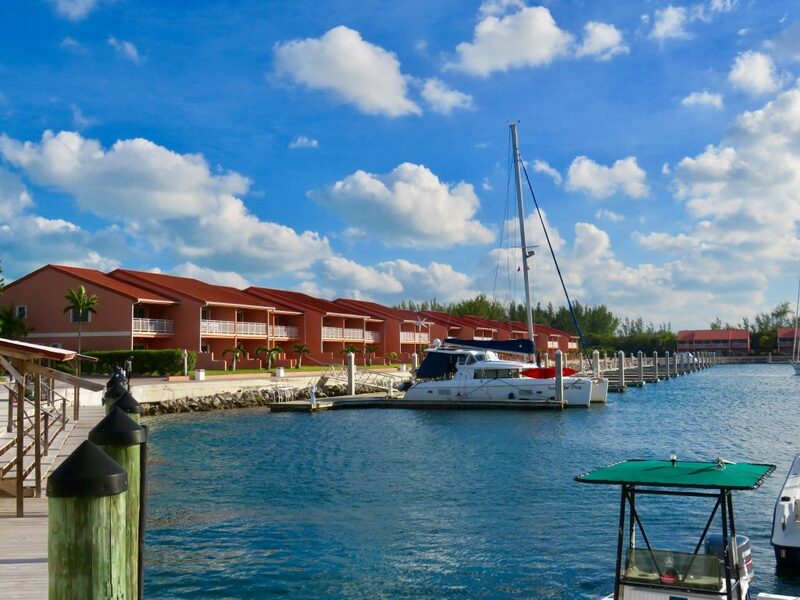 The marina at Chub Cay is a favorite for large Sportfisher boats since it is a very short distance to deep water fishing. It is a beautiful marina but very expensive so we have never stayed there. 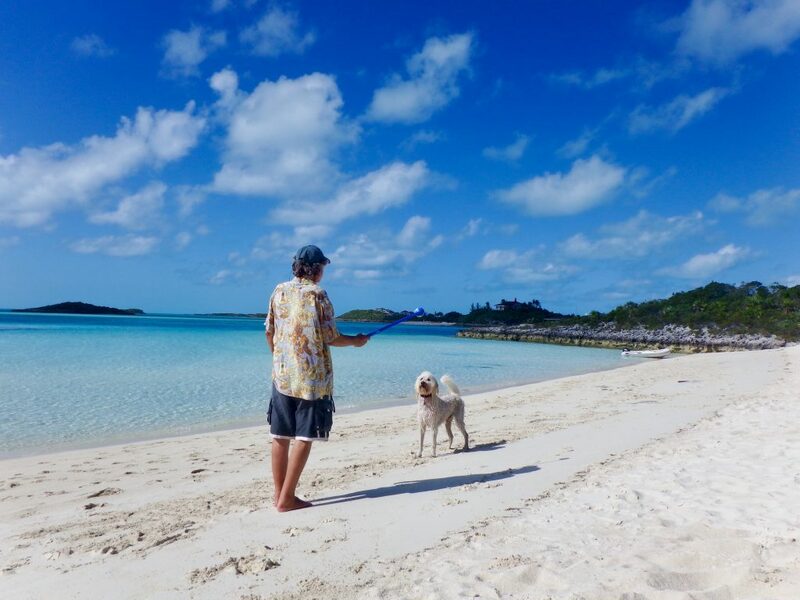 The Chub Cay anchorage is close to the marina channel and usually we are waked numerous times in the evening and early morning as fishermen speed by to enter or leave the marina. This time it was very quiet with not a single Sportfisher or any boats in the marina channel the entire time we were there. Perhaps they were all home for the holidays. The next morning at first light, 0635, we brought up the anchor and were on our way to Nassau. The entire day we were in deep ocean water but seas were only 1-2 feet becoming 3-4 later in the day so it was a rather comfortable sail. Calling on our VHF radio, we asked and were given permission to enter the harbor at 1130 and were at a fuel dock by 1204. 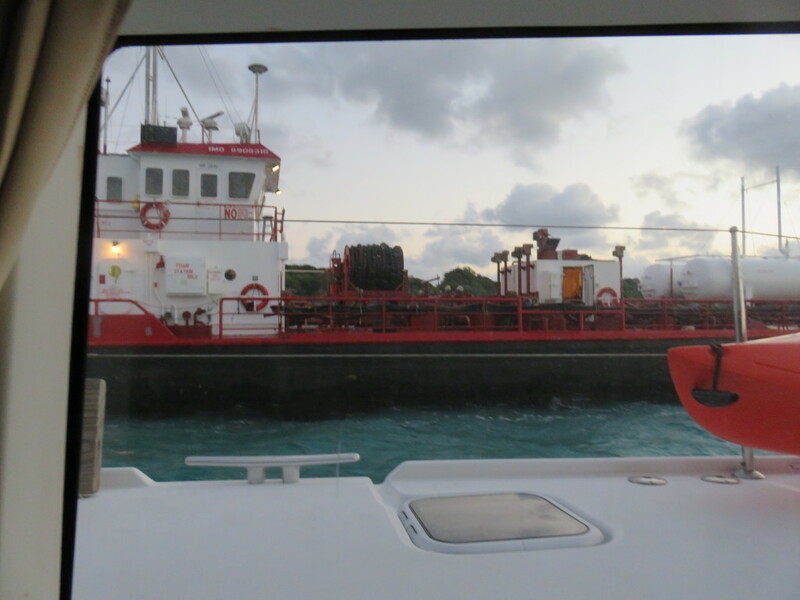 After topping off both 80 gallon diesel fuel tanks, we went around the corner into a slip at Nassau Harbour Club. 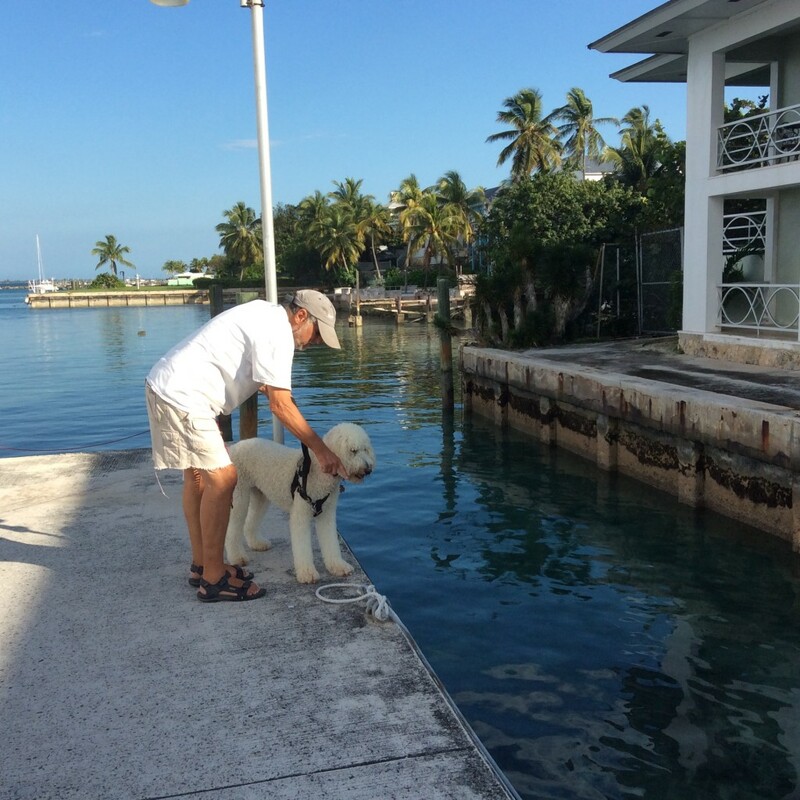 This was the last time we will stay at a marina until we return to Sunset Bay in Stuart in May. Holding is terrible in the Nassau harbor anchorages, there is a lot of current, and it is a dangerous city so we always stay at a marina. 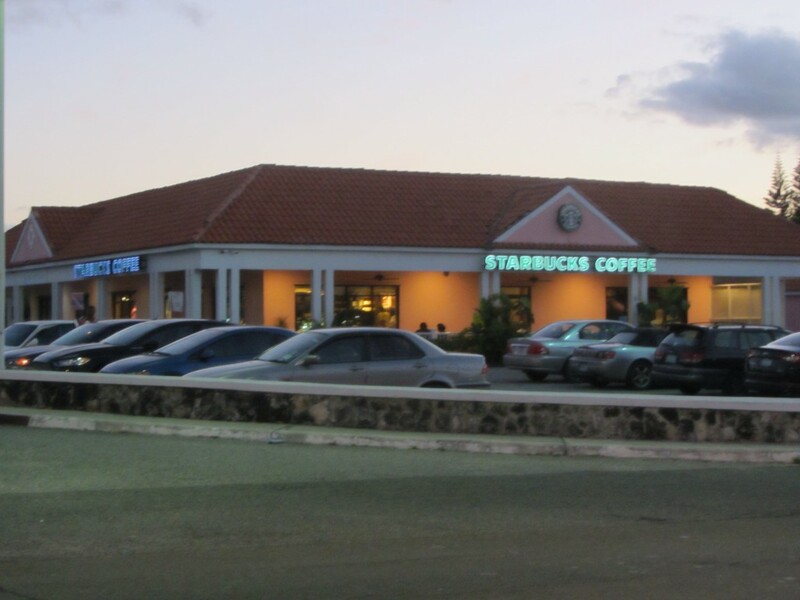 We like this particular marina because we can walk across the street to a strip mall with a Starbucks, a Fresh Market Grocery, a BTC office (Bahamas Telephone Company), Radio Shack and more. There are also marine supply stores a close walking distance down that street. I gave up my addiction to Starbucks last summer but we decided to celebrate getting this far with Frappuccinos. We also picked up some fresh vegetables at the very very expensive grocery store. 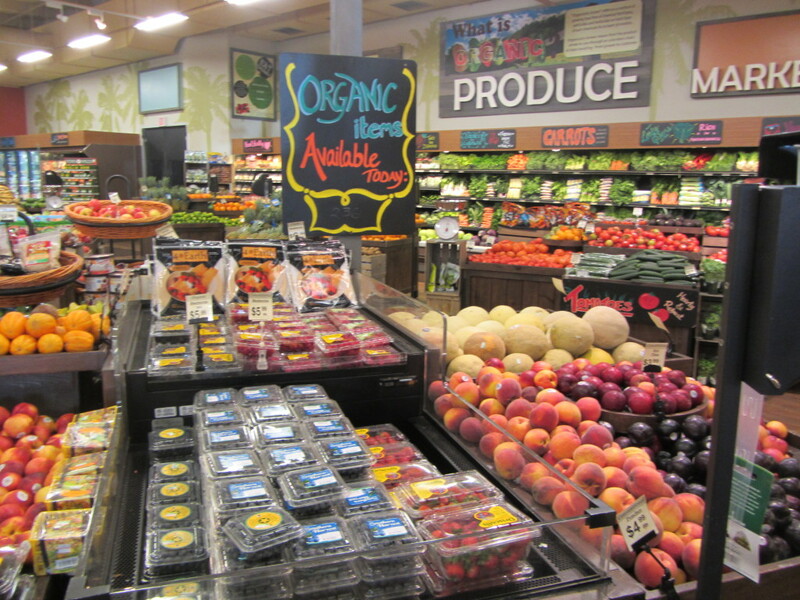 Most items cost double to triple what we would pay at a grocery store in Florida. 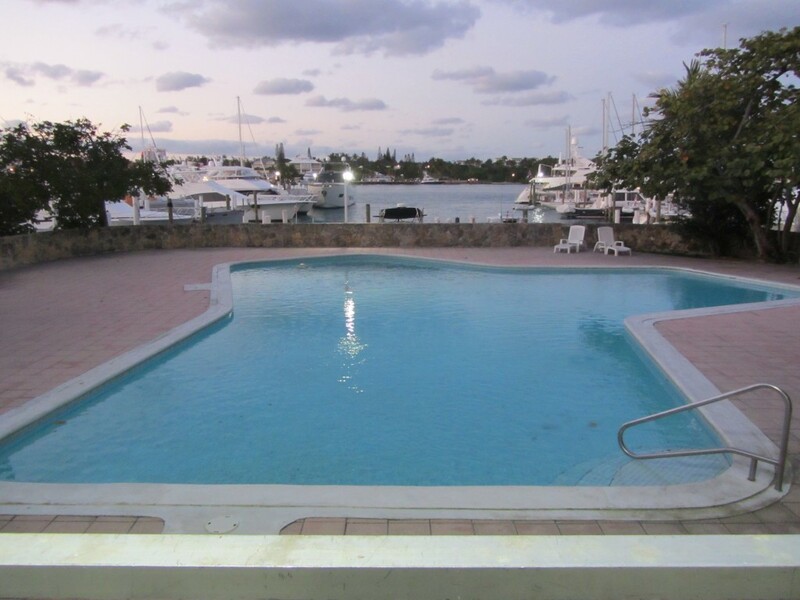 We have stayed at Nassau Harbour Club many times. We have always paid about $1.50 a foot at this marina. Seas the Day is 42 feet long. They charge $8 for unlimited city water (not potable) and power is metered but reasonable. We like being able to wash the boat with a hose and lots of fresh water, especially since everything is usually encrusted with salt by this point. We decided to have our Christmas dinner on Christmas Eve since we had shore power and could heat up our frozen leftovers from Thanksgiving in the microwave. We were also able to use the convection oven, rather than our very unreliable propane oven, for cooking some side dishes. 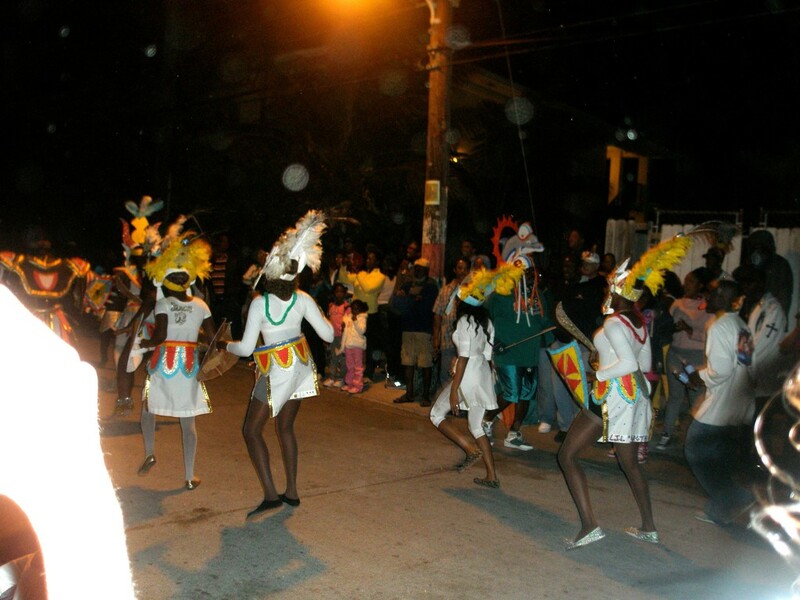 We were in Nassau for one night and wanted to leave early in the morning for the motorsail across the Bank to the Exumas. A very strong storm was predicted on December 26 and we needed to be in a sheltered anchorage. The marina office was supposed to open at 0730 on Christmas Day and we were there to check out at that time but after waiting about 15 minutes with the door still locked, we taped an envelope on the office door with our meter reading and said they could use the credit card they copied the day before when we checked in. We preferred to pay with cash but didn’t want to wait any longer. I checked the credit card online the next day and was shocked to see a charge of $124.26. 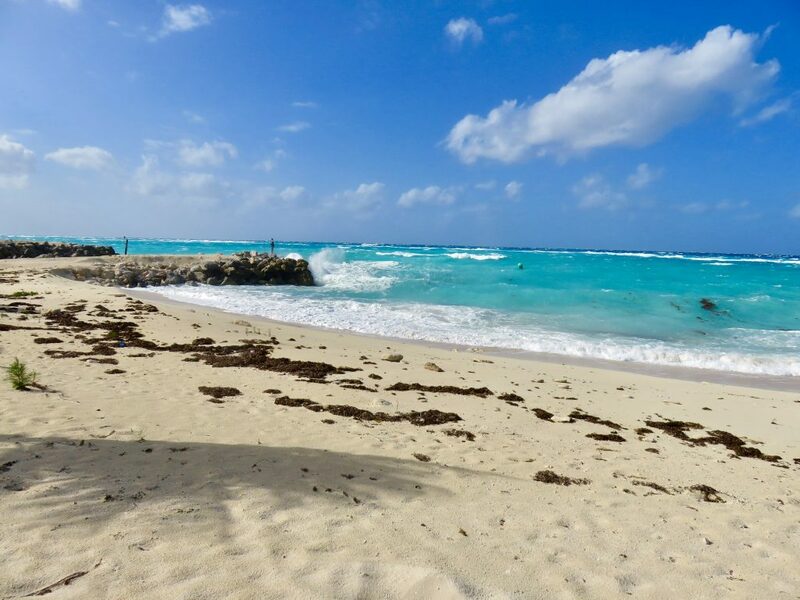 We had paid $100 for an entire week at Bimini Sands (an unusual “special”) and rarely pay more than $1.50 a ft anywhere. I received the receipt below by email. The VAT mentioned is the new 12% tax on just about everything. It went up from nothing to 6% several years ago and last year jumped to 12%. We paid $2.25 a ft for the marina slip plus VAT. Guess we aren’t staying there anymore. 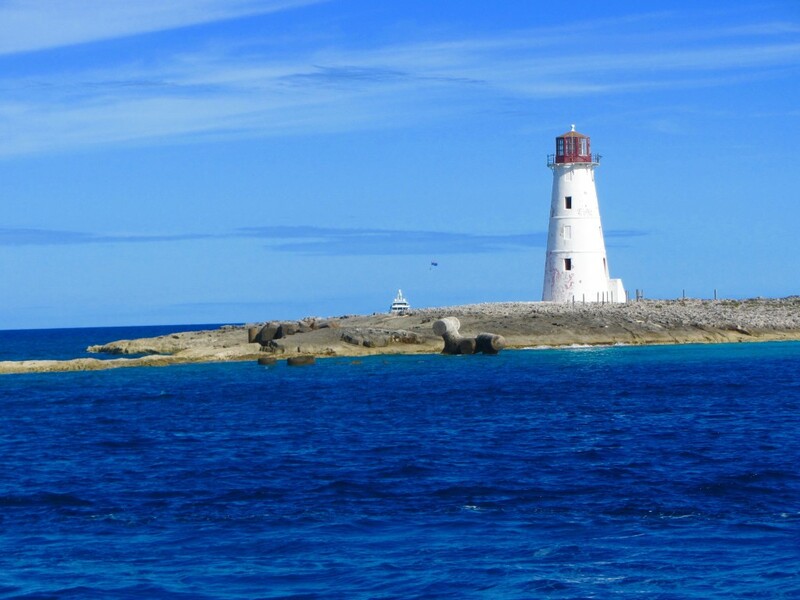 Our intention when leaving Nassau was to cross to the northern Exumas and then sail as far south as we could get in daylight. However, after we left the harbor the wind started gusting over 25 kts and the waves built. We had to reef in the main and were still making 9 kts motorsailing. Usually we average around 7 kts. It was one of the most uncomfortable sails we’ve ever had and it wasn’t even on the ocean. Before we leave an anchorage or marina I always put away any items that could fall and lock all the closet doors and kitchen cabinets and drawers, but this time things were flying around that had never moved in ten years. 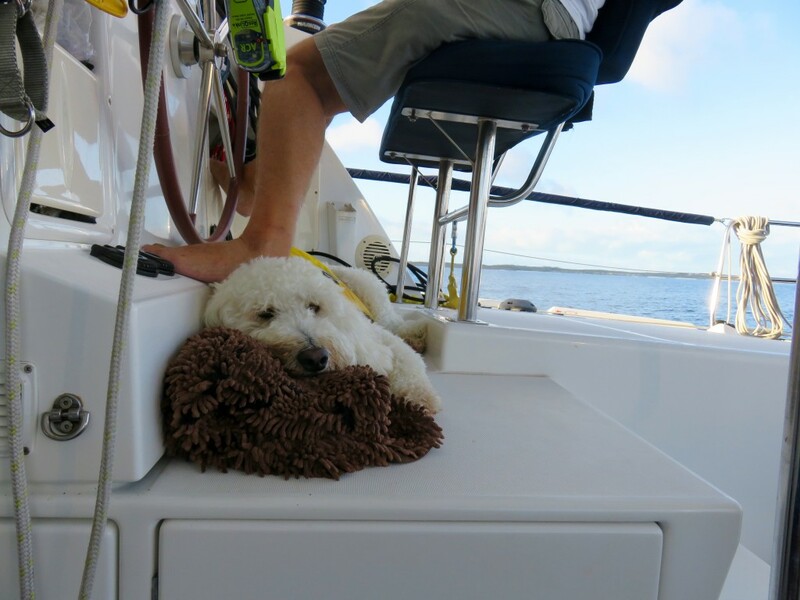 Of course Sailor was not happy with rocking and rolling so I was in bed with him while Mark was at the helm all day. We arrived at Norman’s Cay in the Exumas at 1305 and if the weather had been good we would have had over four more hours to continue farther south, but we had no interest in continuing and entered the anchorage close to the beach. When the front came through the next day we had 40 kt wind with strong squalls and torrential rain. 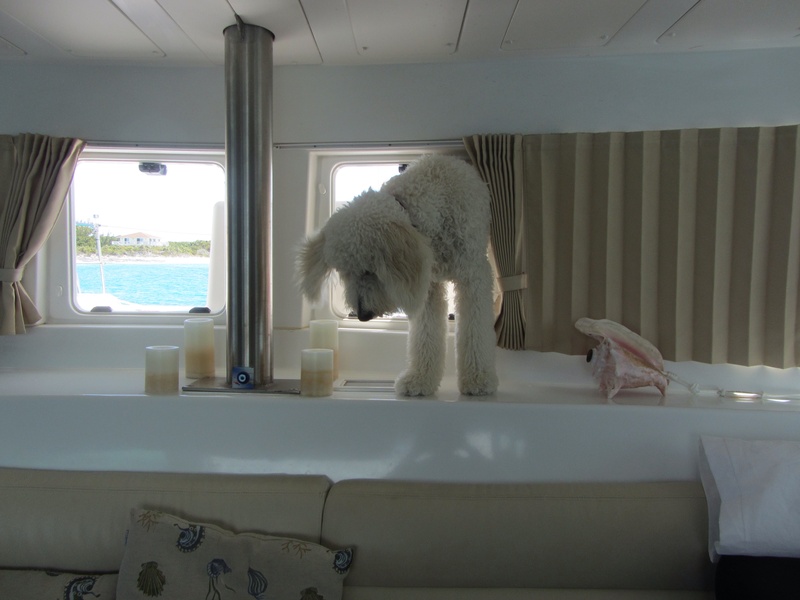 Unfortunately we quickly discovered there was a swell coming around a corner of the cay so we rocked from side to side most of the time we were there. We were at Norman’s Cay for five uncomfortable days. 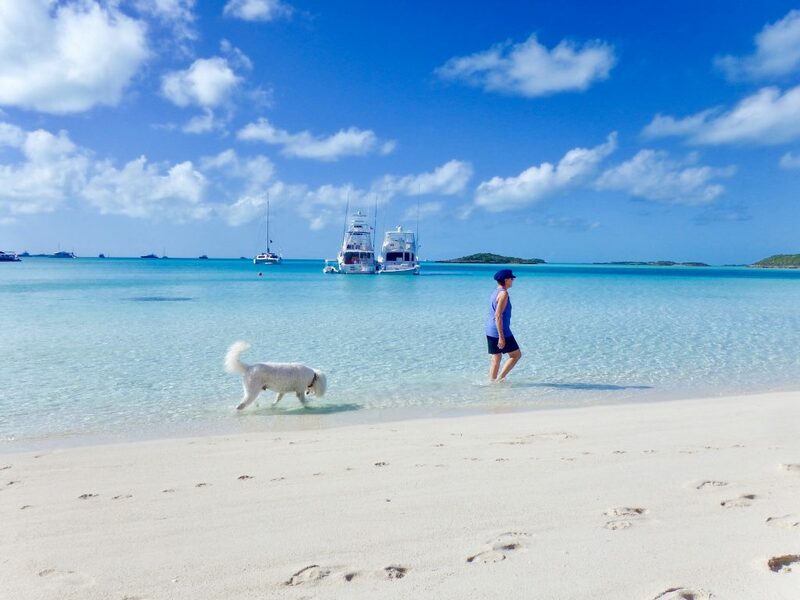 On December 30, 2018, at 0745 we left Norman’s Cay and motorsailed to Big Majors Spot at Staniel Cay, known for the Pig Beach. 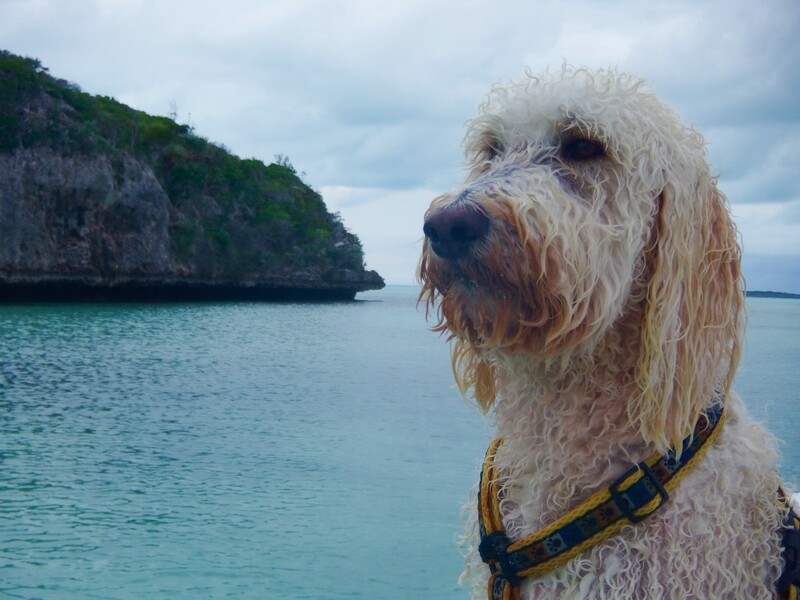 We didn’t make our usual stops in the Exuma Land and Sea Park since it had taken us longer than expected to get this far but we will visit the Park in the Spring when we go to Eleuthera and Spanish Wells. 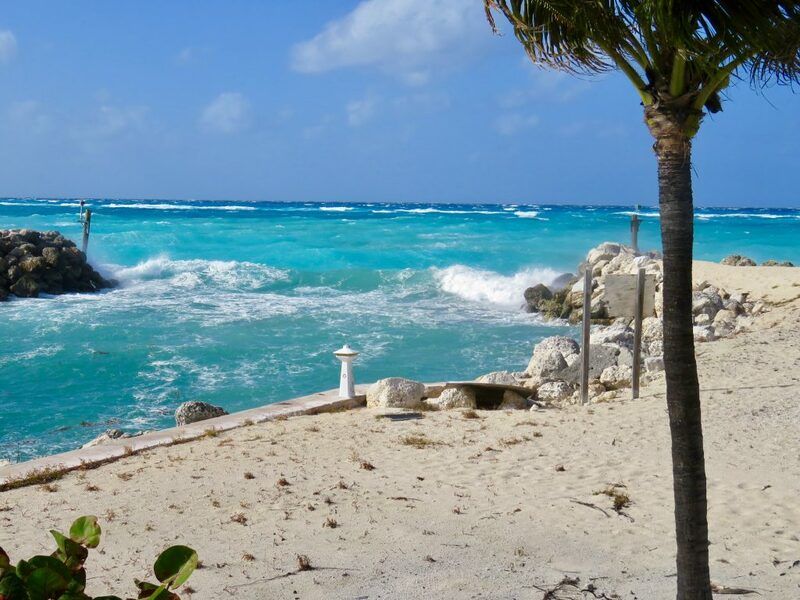 Many cruisers no longer stop at Big Majors and Staniel Cay for a variety of reasons. First, each year more and more large yachts are in the anchorage with their toys: Seadoos, tenders with large fast motors, water skis, water slides off their decks, and we even saw a motorized surfboard this year. Also there are many tour boats and float planes that bring tourists all day long from Nassau to see the swimming pigs. 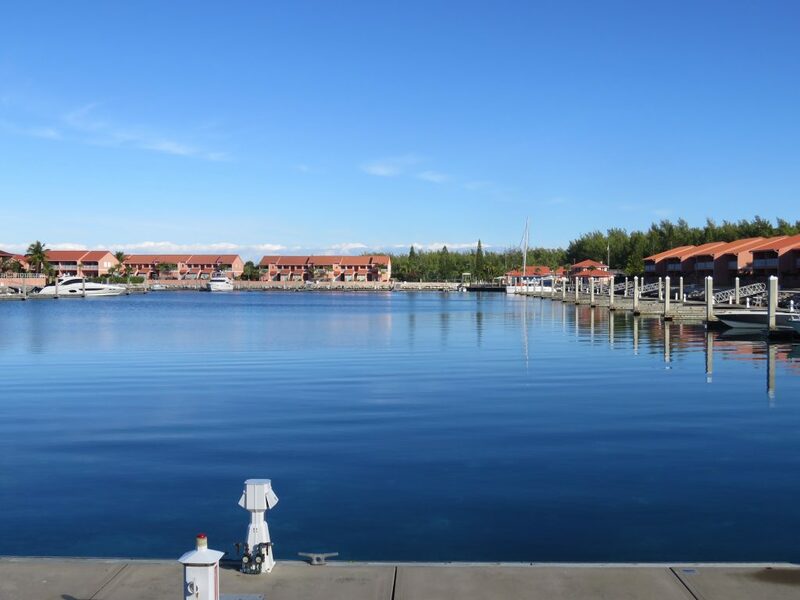 There are several resorts in the area and those visitors often come through the anchorage with fast small boats, which seem to be driven by people with no idea of the problems they cause the anchored boats when they race between us and come within a few feet of boats. 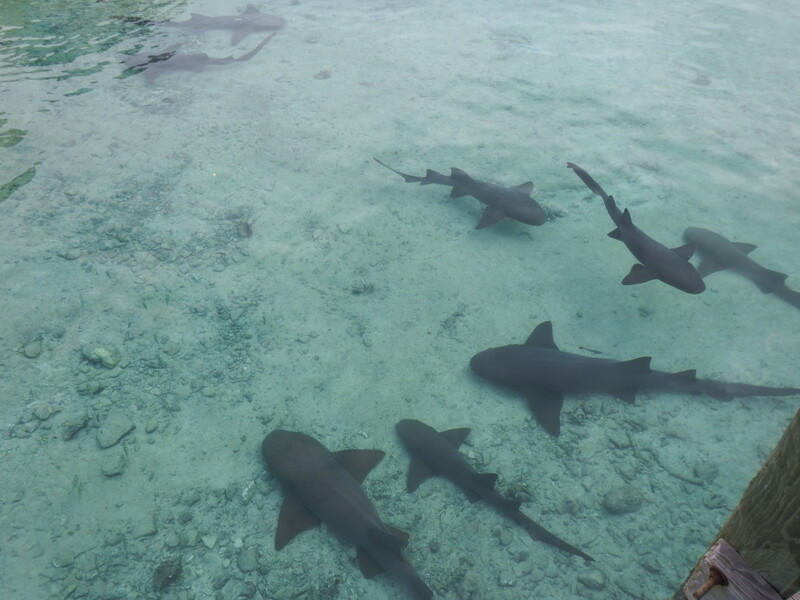 We used to snorkel in Thunderball Grotto and loved it but now numerous tour boats are there at slack tides and the coral is almost dead rather than the showing their vibrant colors of a few years ago plus there are few fish in the Grotto. Just a few years ago we were surrounded by colorful fish while snorkeling inside the grotto. 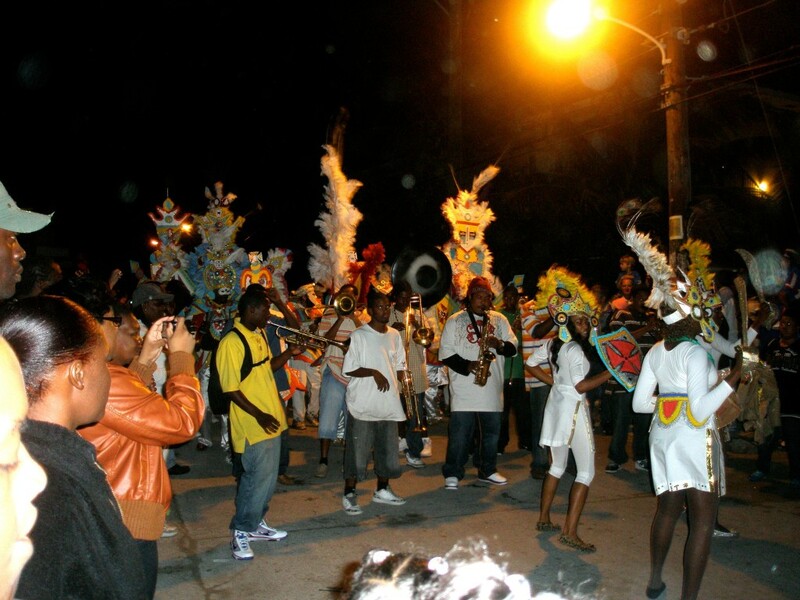 In addition, if you want to get rid of a bag of garbage, two years ago when we were last here it cost $6.00. We didn’t even check this year. On most islands in the Exumas we pay a dollar or two to put la bag of garbage in bins. In Spanish Wells garbage can be put in cans on the streets for free. On all of the islands garbage is burned at dumps. There is rarely any chance to recycle although sometimes schools collect recyclables to raise money. The three very small grocery stores located in houses in Staniel Cay are poorly stocked and very expensive. They get fresh supplies once a week which stay on the shelves about one day or less. 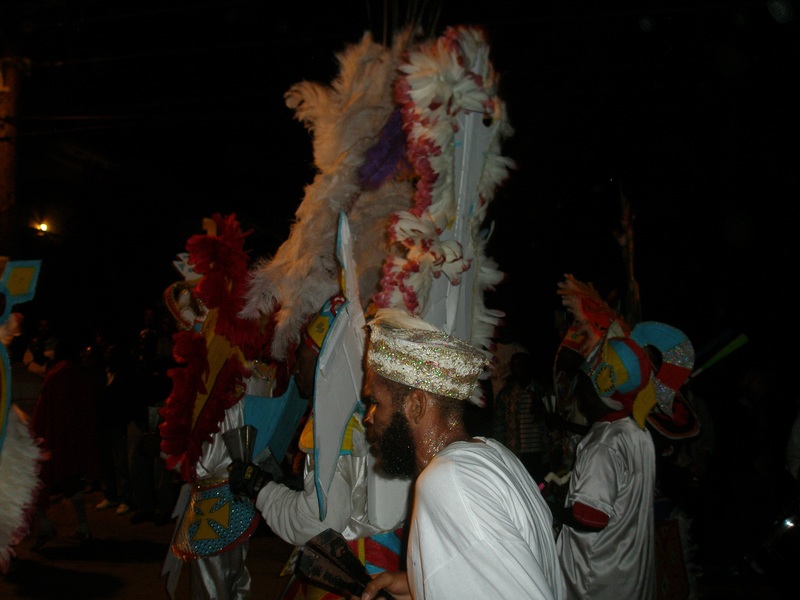 Local residents place bulk orders from stores in Nassau and have them delivered to the public government dock when the supply boat arrives so they don’t depend on the local stores. On the positive side, there is a nice restaurant at the Staniel Cay Yacht Club. The fuel dock has diesel and gas. One huge draw is there is a heavily used airport at Staniel Cay with both commercial and private planes landing frequently. It’s a good place for guests to fly in and out and for cruisers to have parts or other supplies shipped in. We stopped at Big Majors for the beaches for Sailor. 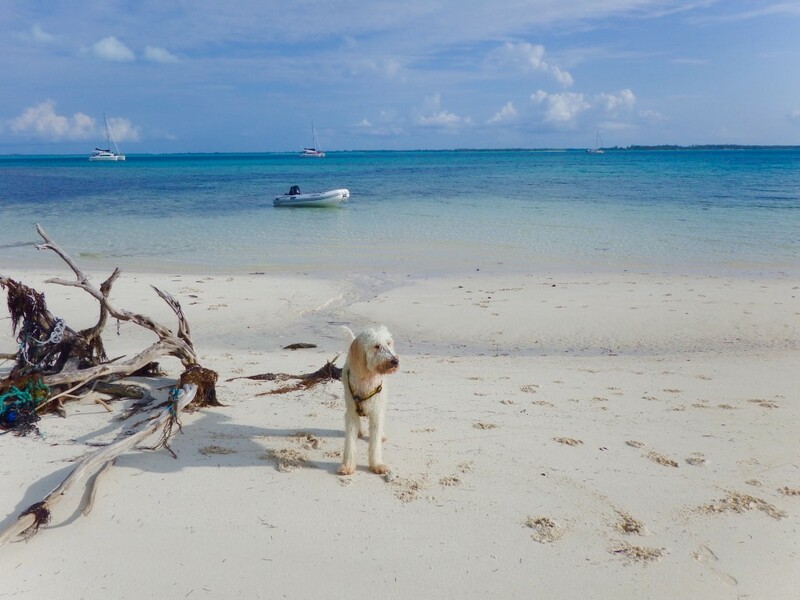 Blackpoint is five miles south and it has many advantages over Staniel Cay but not very good beaches near the anchorage for dogs. 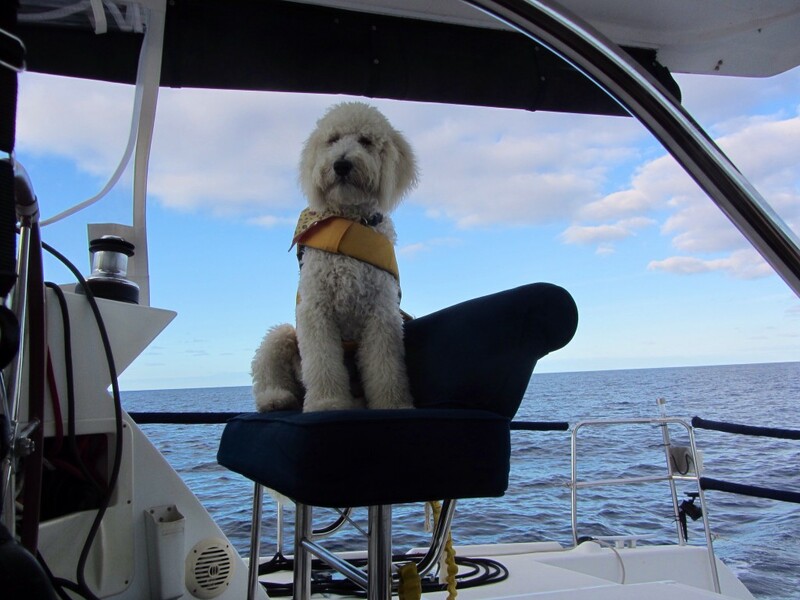 When we arrived at Big Majors, Sailor was anxious to get to the beach but he has learned to be patient because there is a lot to do after we anchor before we can leave the boat. 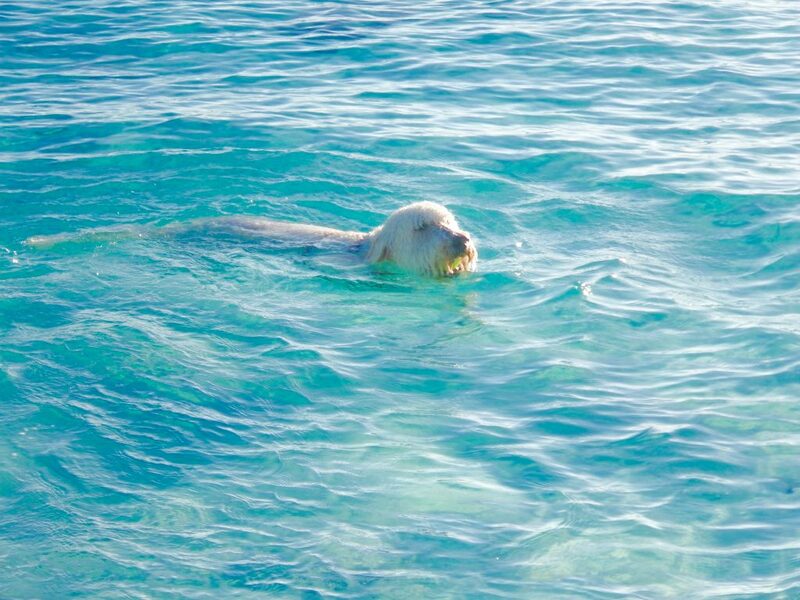 Here a few photos of Sailor enjoying on of the beaches at Big Majors. 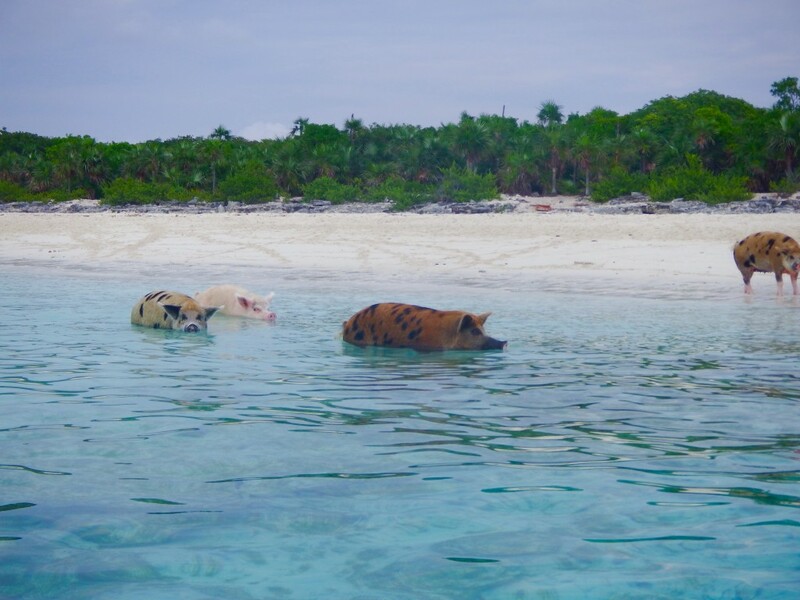 There are three on the anchorage side – Pig Beach, Pirate Beach and a third beach that we use. Even though there are many boats here, we were alone on this beach for over an hour. 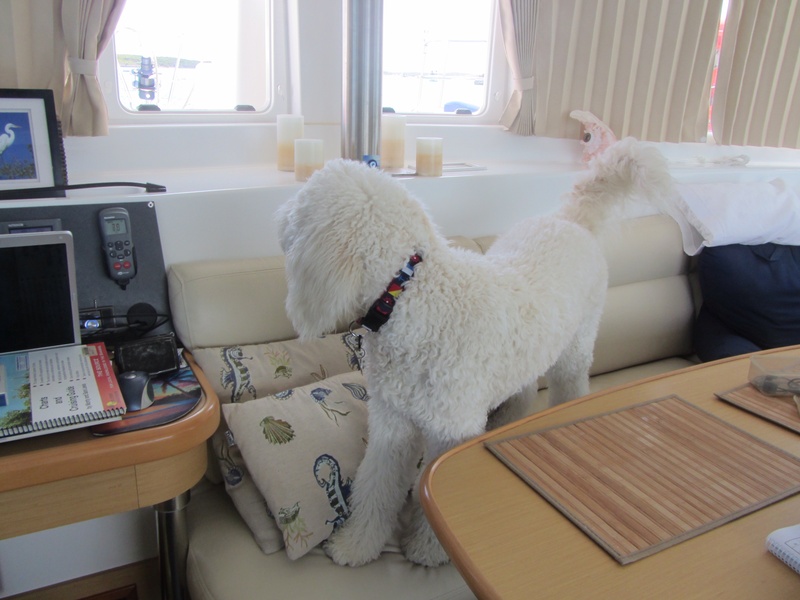 We are anchored on the west side of Big Majors, and there are more beaches around the corner on the south side. On January 2, we will motorsail five miles south to Blackpoint. 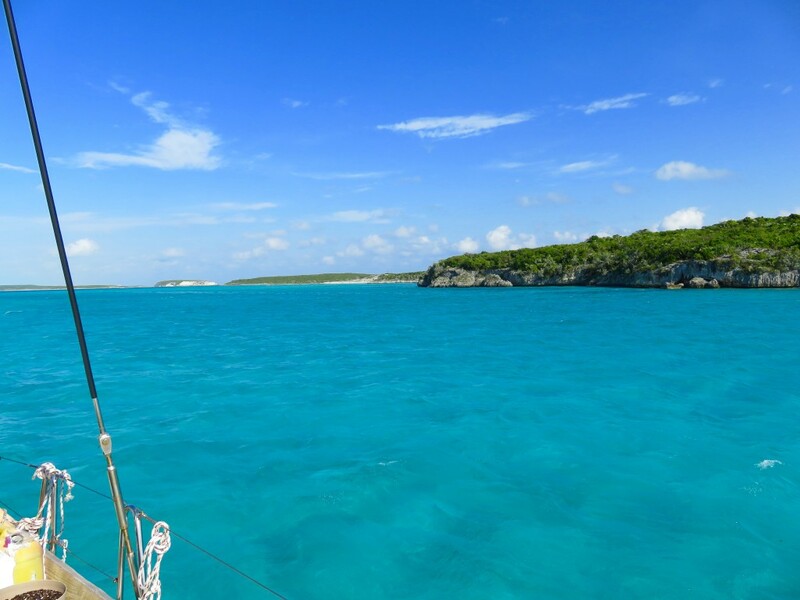 We’ll stay there a day or two, then go further south to Cave Cay where we will hopefully leave the Bank through Galliot Cut and sail south on the Exuma Sound to Georgetown on Saturday. 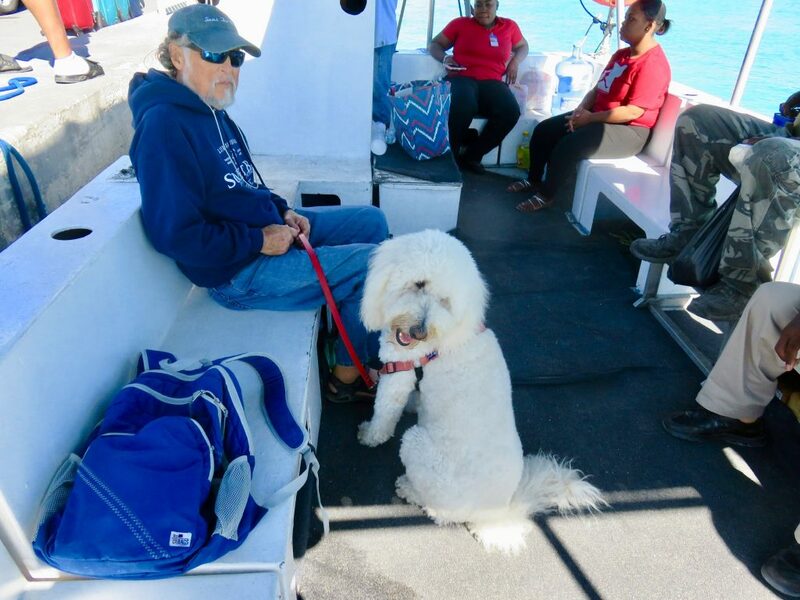 We expect to have lots of company on the Sound since many boats have been waiting for good weather to continue moving south either to Georgetown or further on to the Caribbean. 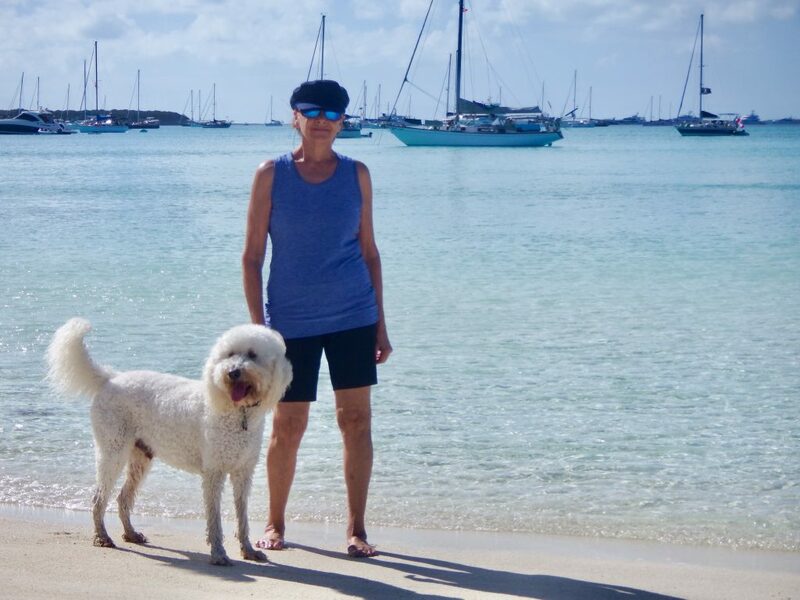 This entry was posted in 2018-2019 Bahamas Cruise, Big Majors Spot, Chub Cay, Nassau, Normans Cay, Staniel Cay and tagged Baking, Big Majors, Blackpoint, Chub Cay, Diving, Exumas, Nassau, Nassau Harbour Club, Thunderstorm, Weather, Wind on January 1, 2019 by Jan.
On January 8, 2016, we left Bimini for Chub Cay in the Berries at 0520, obviously in the dark, arriving at the Chub Cay anchorage in daylight at 1700. We were going almost directly into the wind and made good time, but it wasn’t a comfortable ride. 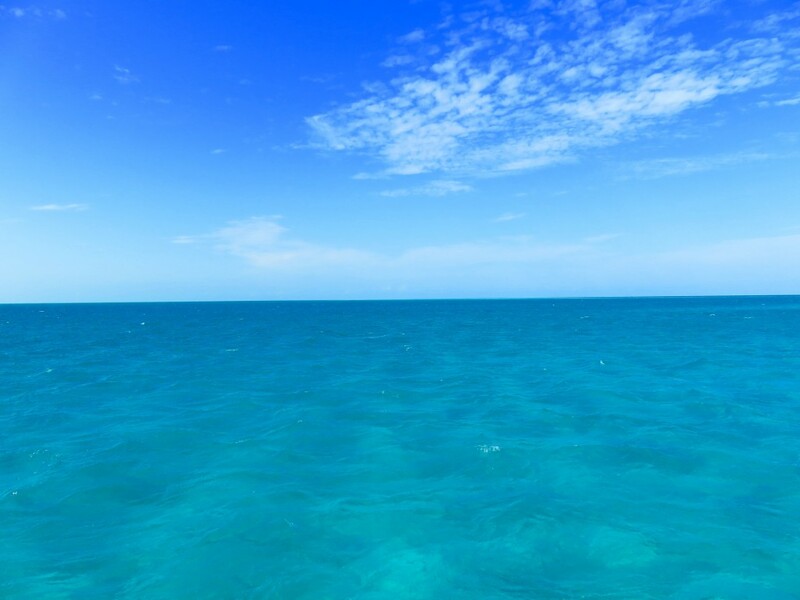 However, we were on the Mackey Shoals portion of the shallow Great Bahama Bank for most of the trip and the water was beautiful. Chub Cay anchorage is not the best, but OK for one night. It is often rough because large fishing boats race in and out of the channel to the marina, which is right next to the anchorage, causing huge wakes. It is close to deep water, where the fishing boats are headed, and often there are uncomfortable swells. Also, Chub Cay is private so we aren’t allowed to take Sailor ashore. Below was our view while sailing on the Bank. Unfortunately we had to stay a second day in the Berries since the sea and wind conditions were still unfavorable for going on to Nassau. Also the wind was clocking and the conditions were getting worse at Chub Cay. In the morning we moved to nearby Frazier’s Hog Cay and while the first part of the trip around the end of Chub Cay was VERY rough, it smoothed out and we spent a comfortable night at Frazier’s Hog Cay. This will probably be our stop in the Berries from now on instead of Chub Cay. 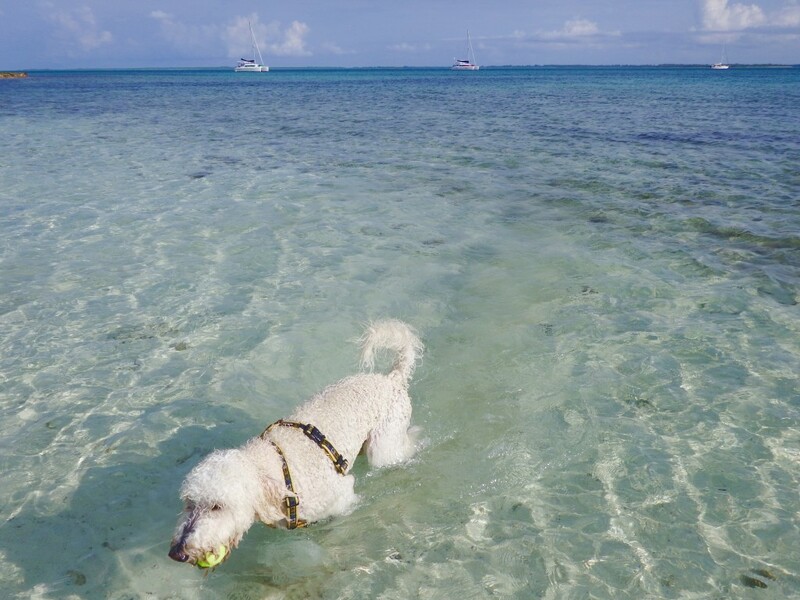 We had a nice time swimming off the beautiful beach and Sailor got lots of exercise chasing his ball. The evening ended with a gorgeous sunset. 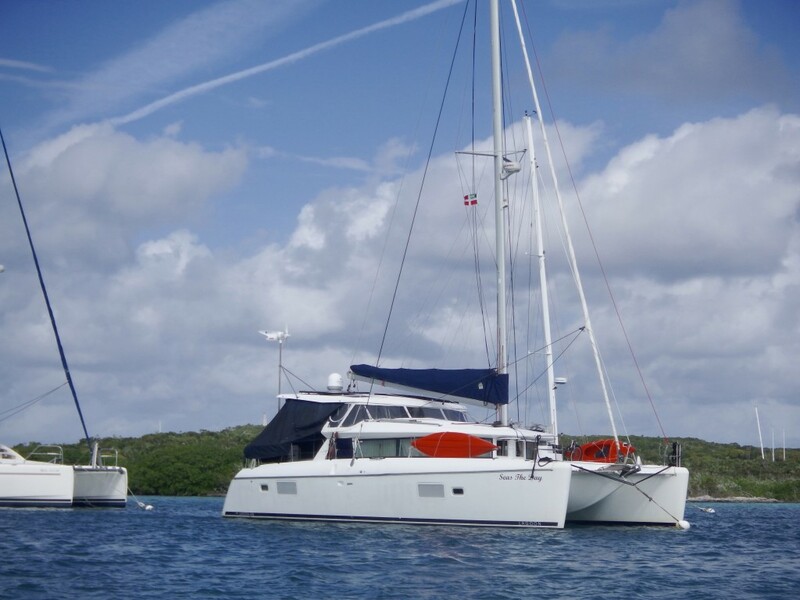 On January 9, we reluctantly left our anchorage in the Berries headed to Nassau. We heard on Chris Parker’s morning report that the seas were 6-8 ft with over 3 ft swells on the beam and we try to only sail in 3 ft seas or less. 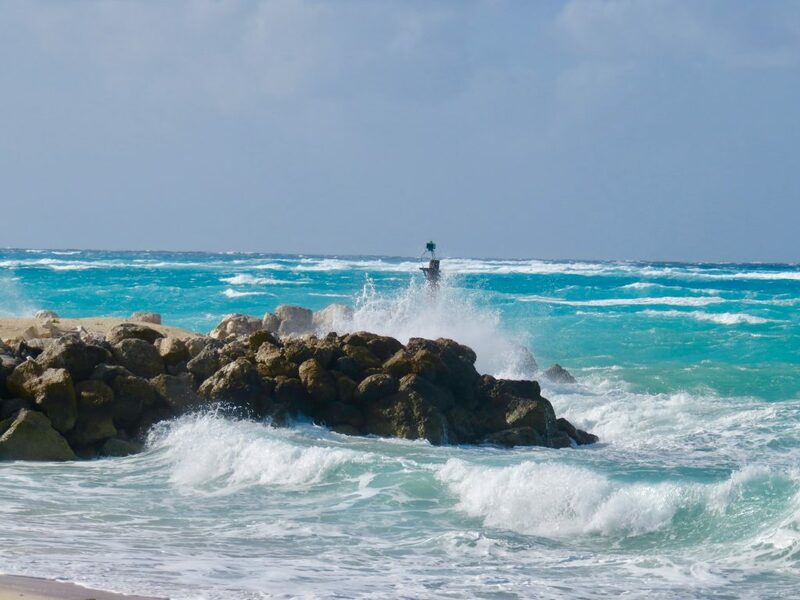 However the weather this winter in the Bahamas has been very different than usual with constant storms and poor sailing conditions for long periods of time. 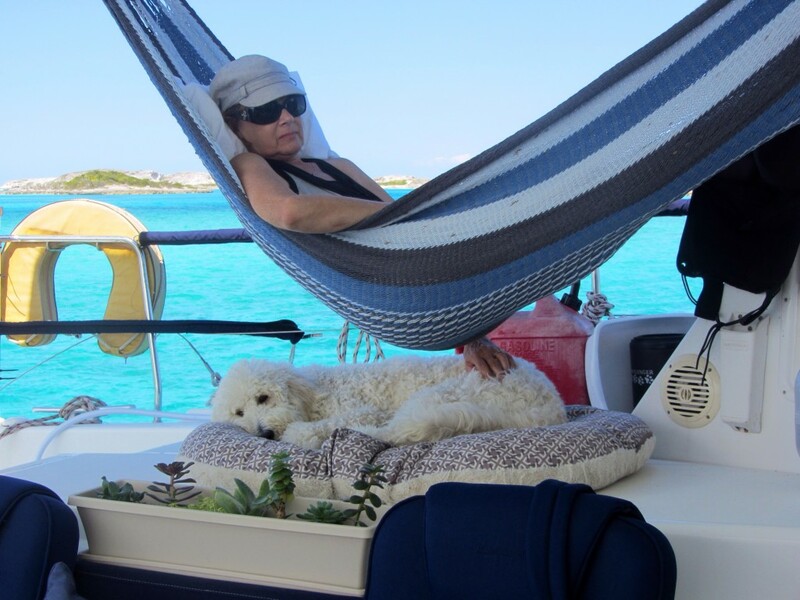 This was our last sail on deep water until we go out on the Exuma Sound for one day to Georgetown. The winds were also not great at SSE 19-20 kts gusting 22. It was a rough ride, in fact Mark wrote in our cruising log, “Worst sail by choice ever.” Thankfully it wasn’t a long sail, leaving at 0715 and arriving in Nassau at 1230. 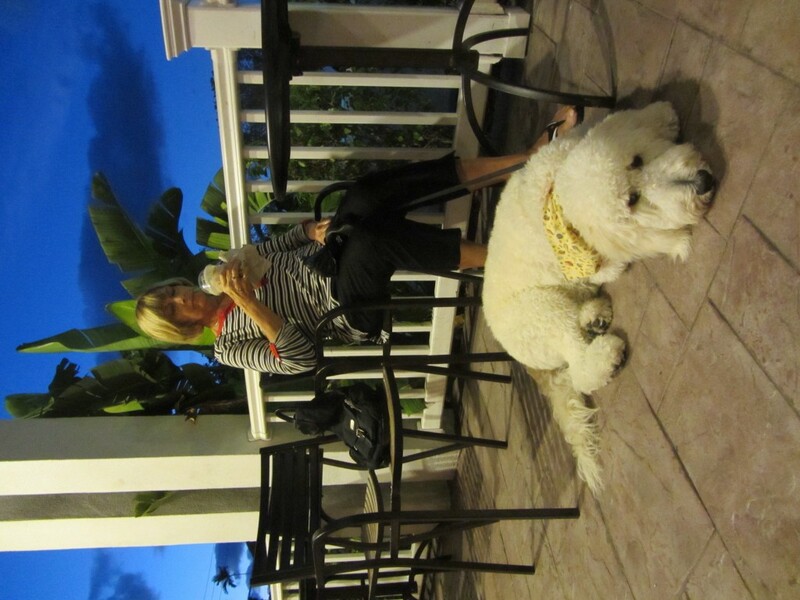 We had reservations at Nassau Harbour Club and enjoyed a quiet night in a slip. 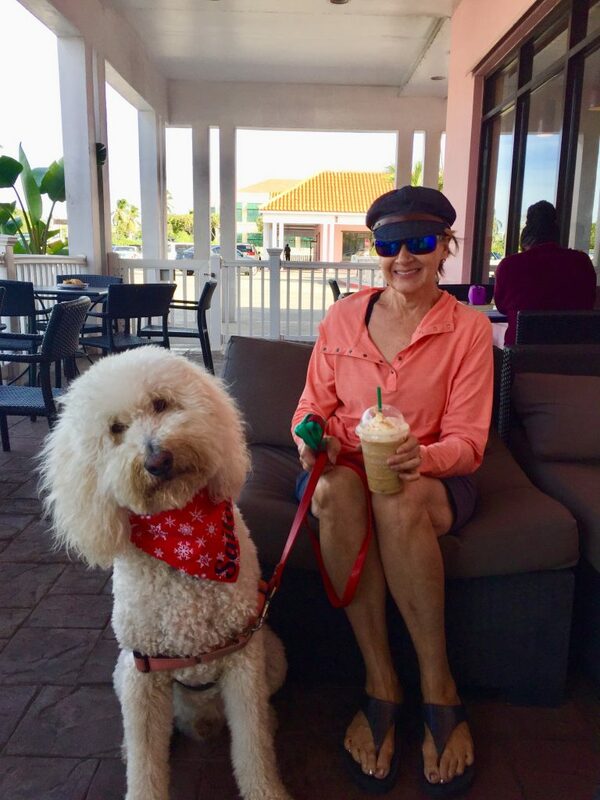 Of course, we had to have our last frappuccinos at Starbucks and visit the Fresh Market grocery store, both right across the street from our marina. The photo of Starbucks below is taken from the exit of the marina. 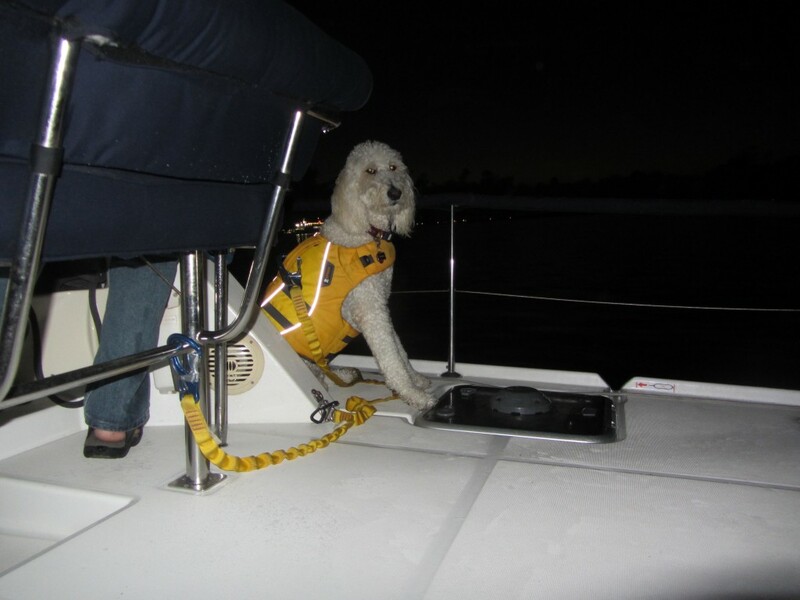 Two years ago, when Sailor was 7 months old, we stopped at this same marina and Sailor, spooked by fireworks (in February!) jumped off the boat, ran down the dock in the dark, and fell into the water when the dock turned to the right as he kept going straight. Mark showed him the very spot this happened, but not sure if Sailor remembered. 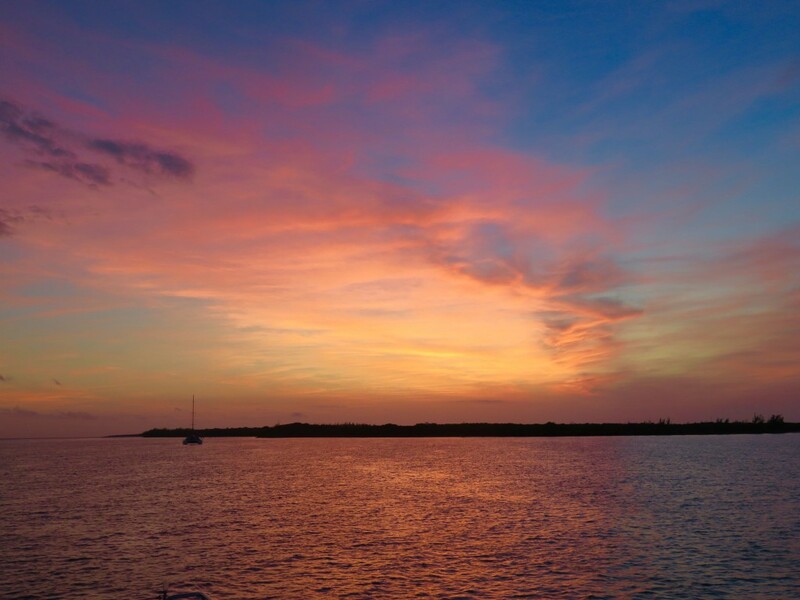 While our sail from Frazier’s Hog Cay to Nassau was rough, other boats had come in after sailing straight from Bimini or the States over a period of several days, and they had horror stories to tell. A boat in a slip across from us had taken on water. 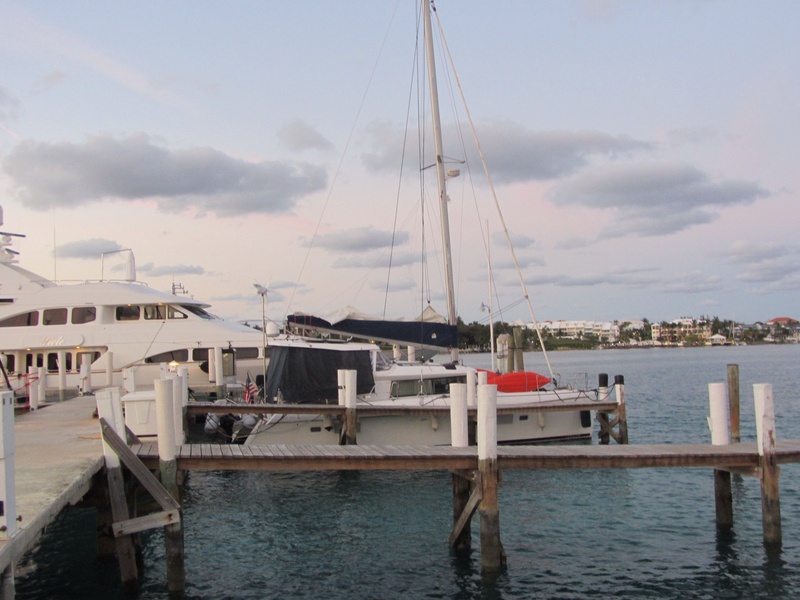 The marinas in Nassau were filled with tired cruisers. We were glad we waited the extra day to leave the Berries even if we still had an uncomfortable sail. 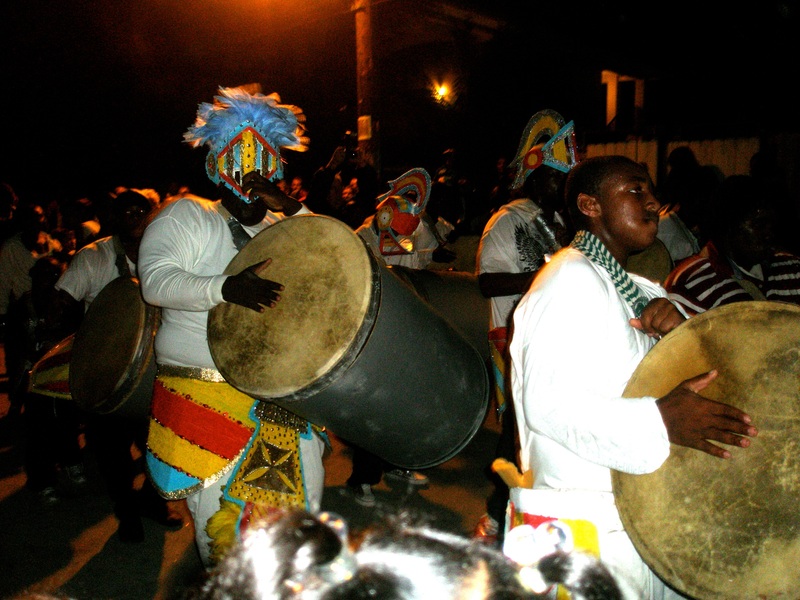 We try to never stay longer than one day in Nassau. It is not a safe city, and other than crossing the street from the marina to the strip mall, we don’t have anything else we want to see or do there. Boats have even been boarded by thieves at several of the Nassau marinas and it is dangerous to be out on the streets after dark. 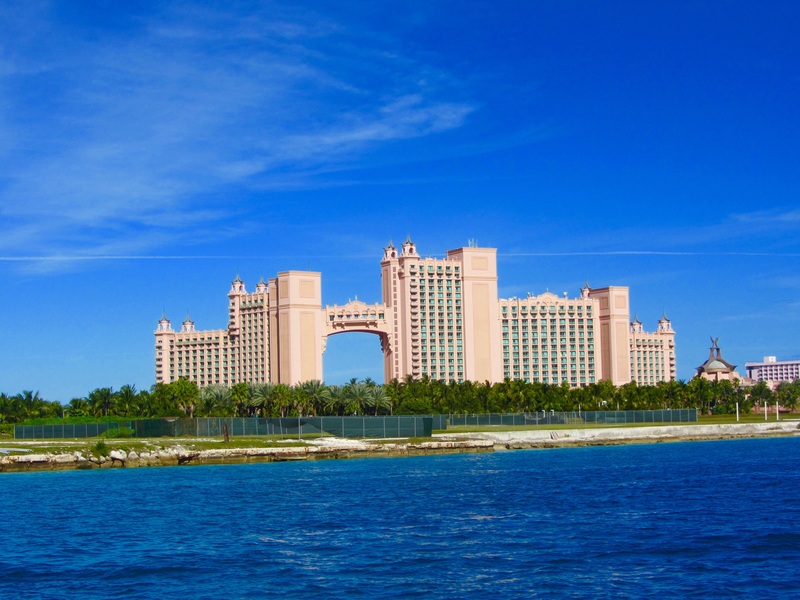 Paradise Island, where most tourists go, is across a bridge and probably safer. 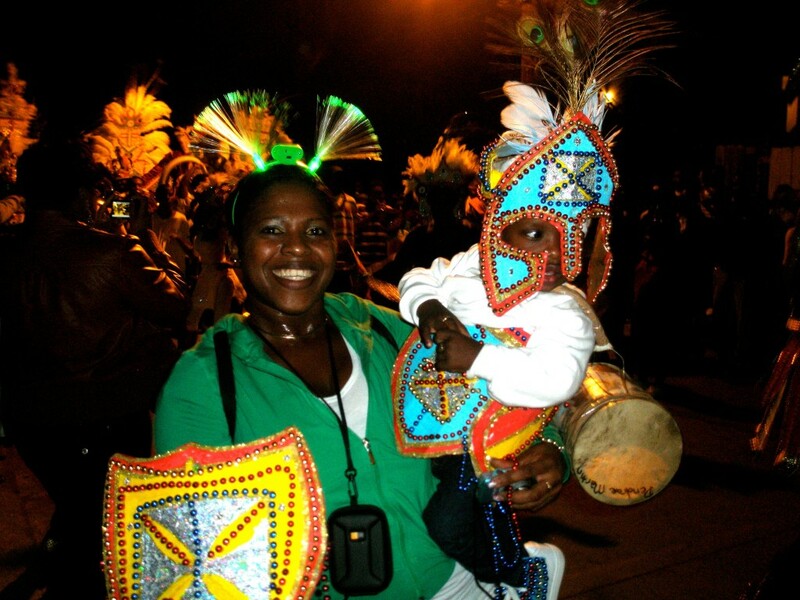 Nassau is on New Providence Island and is where the cruise ships stop. Our boat buddies since Miami on Renaissance II, another Lagoon 420, decided to stay in Nassau since they had never been there and we left the next morning for Norman’s Cay, our first stop in The Exumas. 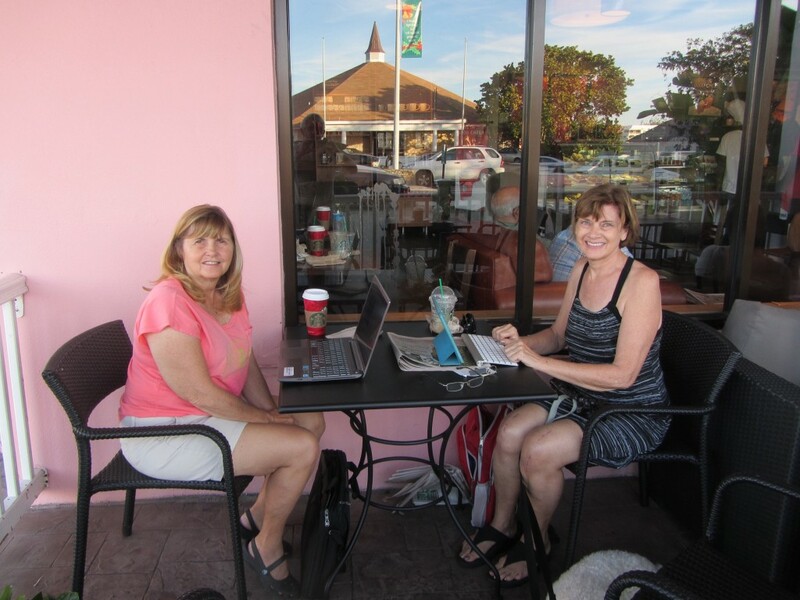 On January 11, we left the last marina we would stay at until we return to Sunset Bay in Stuart, Florida, at the end of May. The route to The Exumas is across the Yellow Bank portion of the Great Bahama Bank. We had a great wind angle for sailing although on a long day we always use the engines and sails and at one point were motorsailing at 8.3 kts. 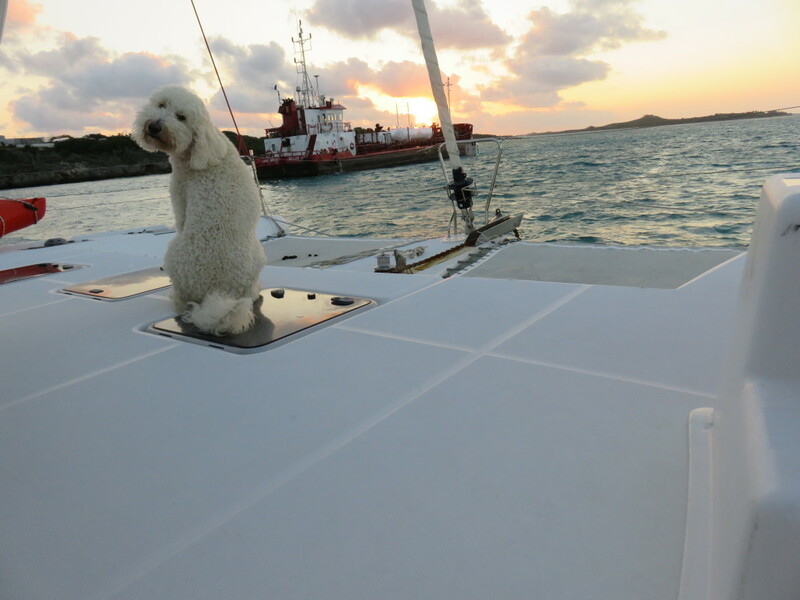 We left Nassau at 0900 and arrived at Norman’s Cay at 1445. It was almost full when we entered the anchorage because strong winds were forecast for that night. 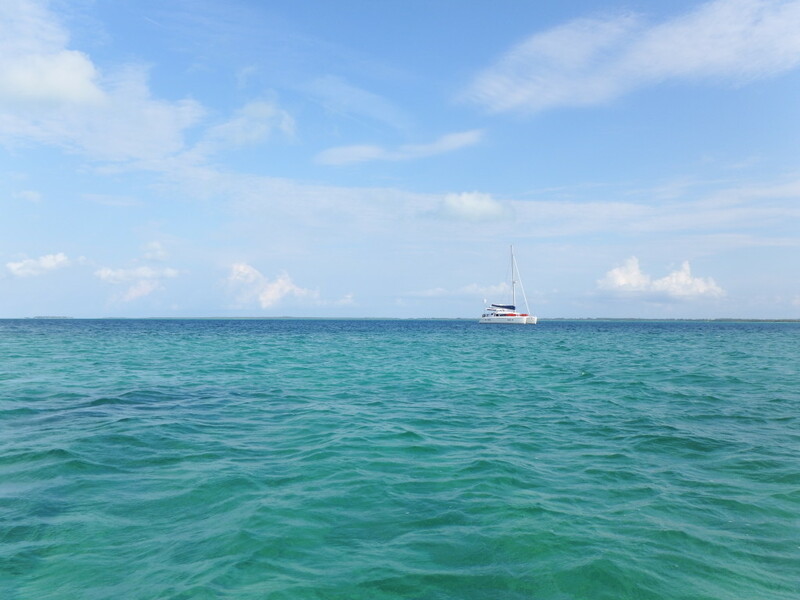 We anchored southwest of the sunken plane and several boats came in after us but left, probably going south to the next anchorage or mooring balls at Shroud Cay. During the night we had high winds and rain while turning 360 degrees with the strong current. 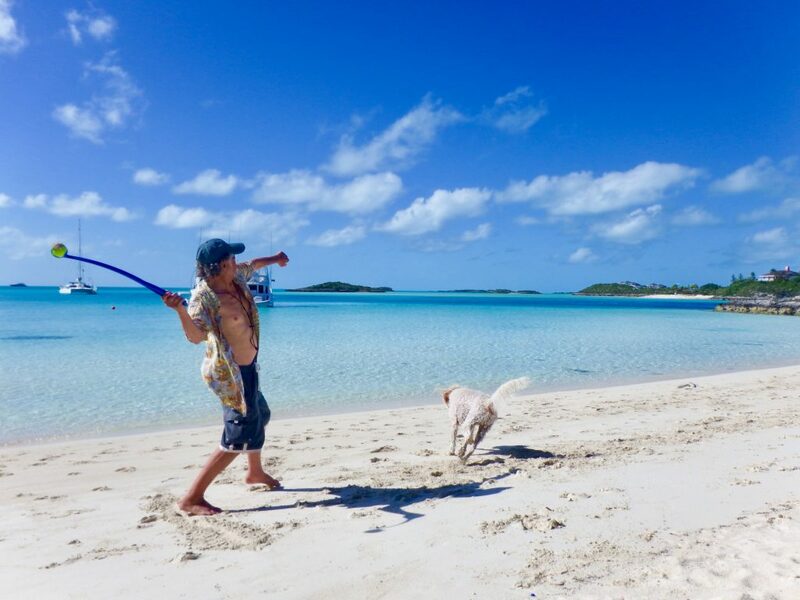 After listening to Chris Parker’s report the next morning, we decided the weather was settled enough to head south to Big Majors/Staniel Cay. This meant we were going past the entire Exuma Land and Sea Park, something we would never do if we weren’t planning to return on our way north in April. 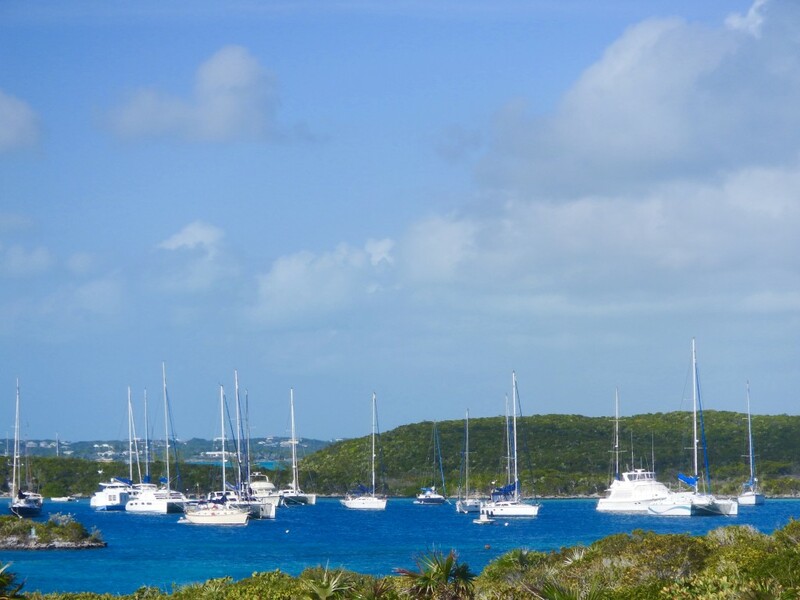 The park has the best hiking, kayaking, beaches, and snorkeling in the Exumas. Our goal was to get to our mooring ball in Georgetown as quickly as we could safely move. 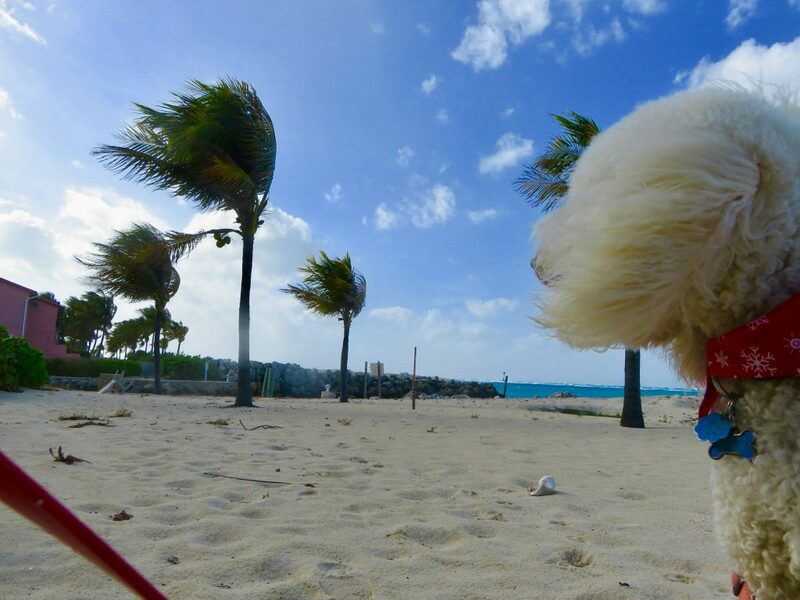 Friends who were already there told us the balls were being taken quickly, perhaps in part due to the 100+ kt storm they had while we were safe at a marina in Bimini. We left Norman’s Cay at 0740 and dropped the anchor at Big Majors at 1230. We made very good time, outrunning a squall coming from the ENE as we left Norman’s Cay followed by a sunny day. Big Majors is a large, excellent anchorage, unless the wind is from the west. 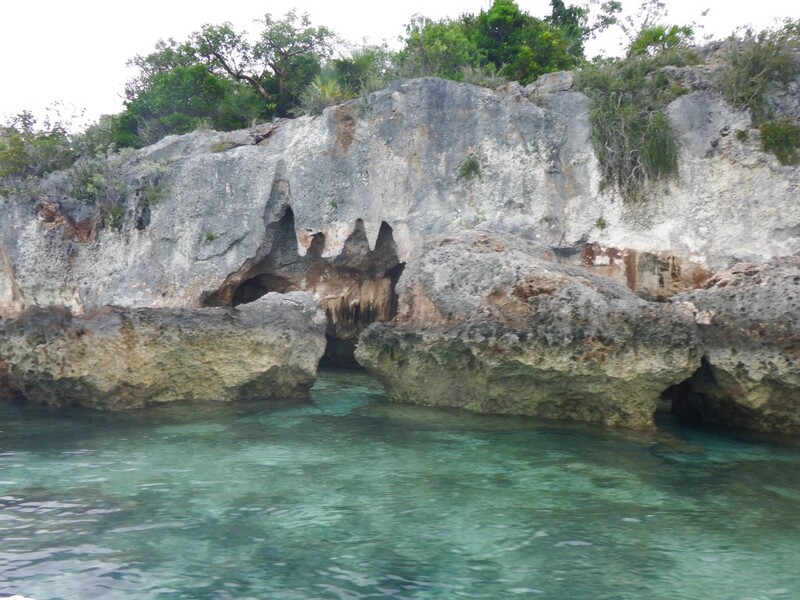 We will be returning here in mid-April to pick up good friends Carolyn and Ed (S/V Sharkitecture) so we didn’t mind missing snorkeling at Thunderball Grotto. 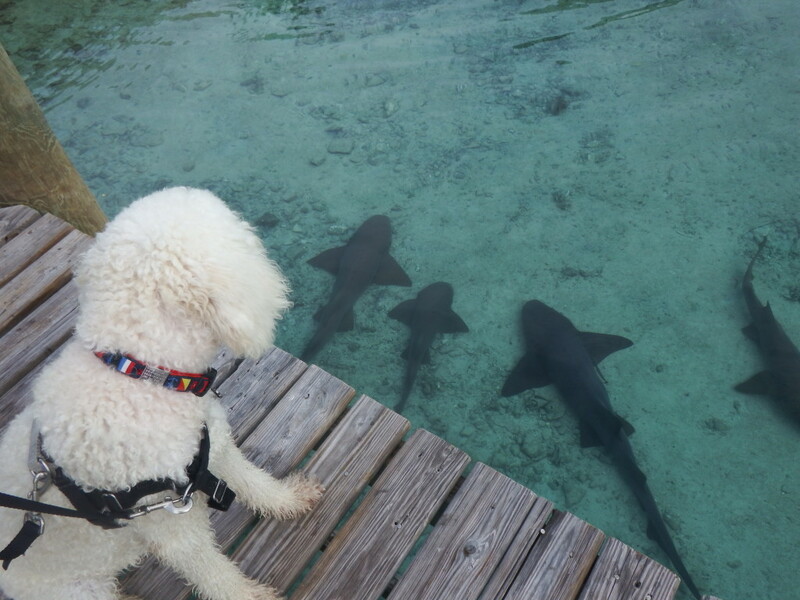 We did go ashore for a walk and Sailor got to visit the nurse sharks who hang out at the marina waiting for someone to drop discards from the fish cleaning station. 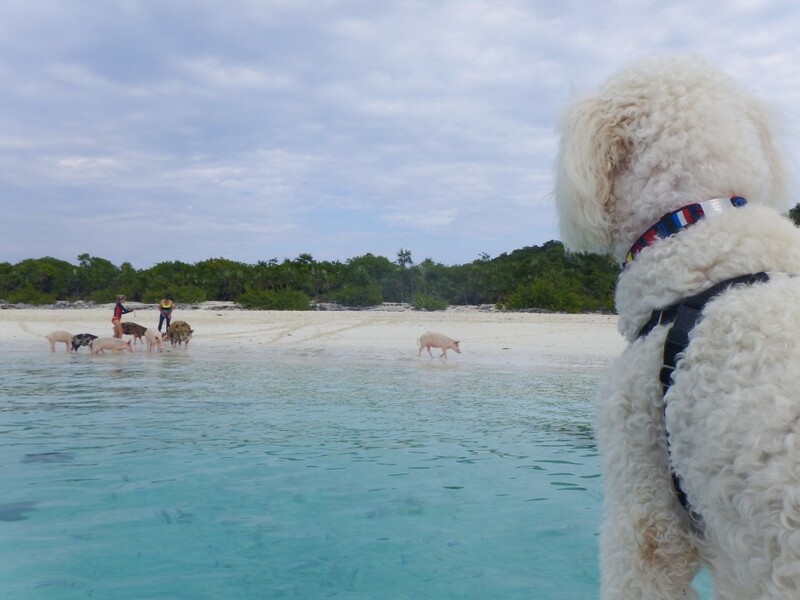 Of course we had to bring him to see the famous swimming pigs also. The next morning we made the short trip to Cave Cay, where we planned to exit the cut to go out on Exuma Sound to Georgetown. 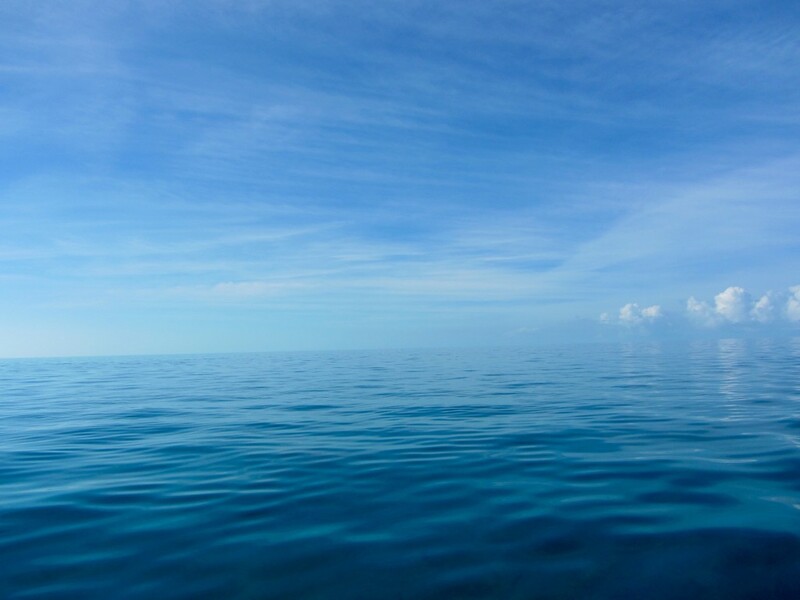 We knew we would have several days to wait for calm seas and favorable wind. 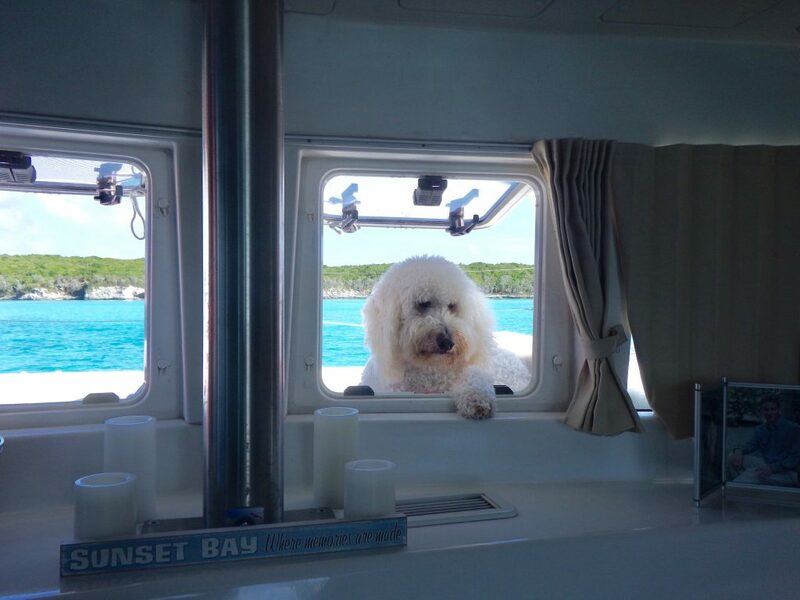 We left Big Majors on January 13 at 0825 and arrived at 1130, the only boat in the anchorage outside Cave Cay Marina. It was a very pleasant sail and after dropping the anchor, Sailor and Mark headed to a beautiful beach near our boat. 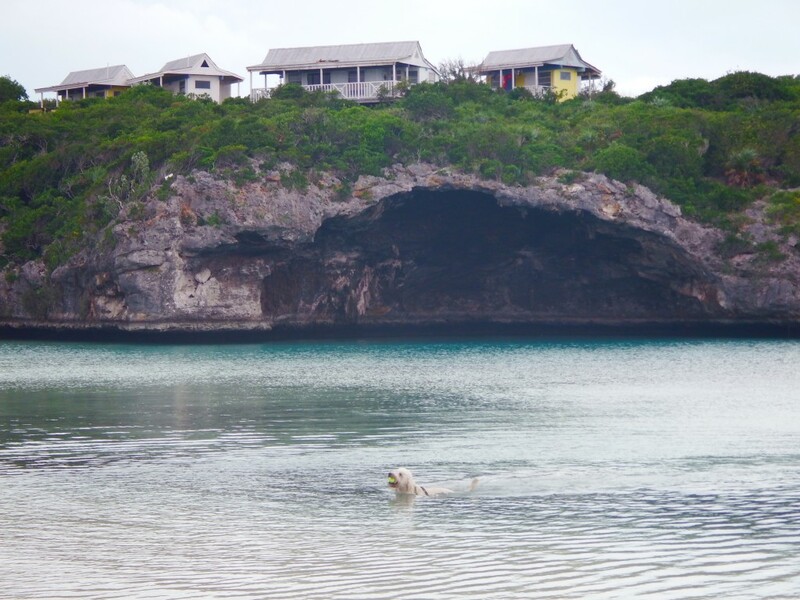 The shore has some interesting caves and there are many more on the cay, thus the name “Cave Cay.” Mark and Sailor also took the dinghy into the very protected marina at Cave Cay. He reported that it is a hurricane hole marina with excellent docks, but it seems to only get boats in its slips during very bad weather. During the several days we were in the anchorage, two boats joined the one that was already there. Houses and caves were next to the beach where Sailor played. 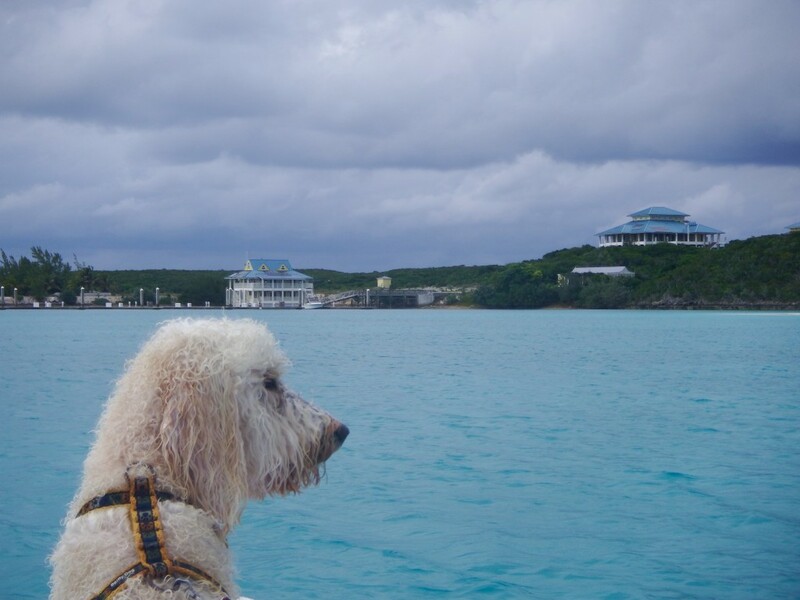 Sailor checked out the marina at Cave Cay. We spent three nights at Cave Cay waiting for the Exuma Sound sea state to calm down. On the first morning we had a BIG surprise. We got up at 0630 to listen to the Chris Parker marine weather report and saw a 160 ft long tanker named Tropic Breeze headed right towards us. (We have AIS and checked the info about the tanker.) We saw her anchored on the deeper south side of Cave Cay Cut the night before and early that morning she was coming to our shallow anchorage. Tropic Breeze motored straight for our starboard side, then turned and went a few feet off our aft, turning again passing us on our port side. A short distance past us, her anchor dropped. 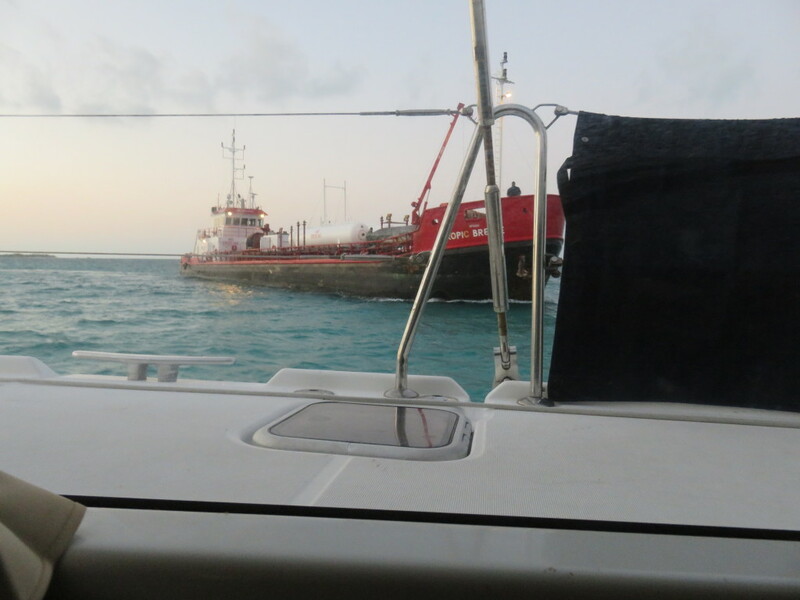 Next, we saw a small boat with a diver in it next to the tanker. 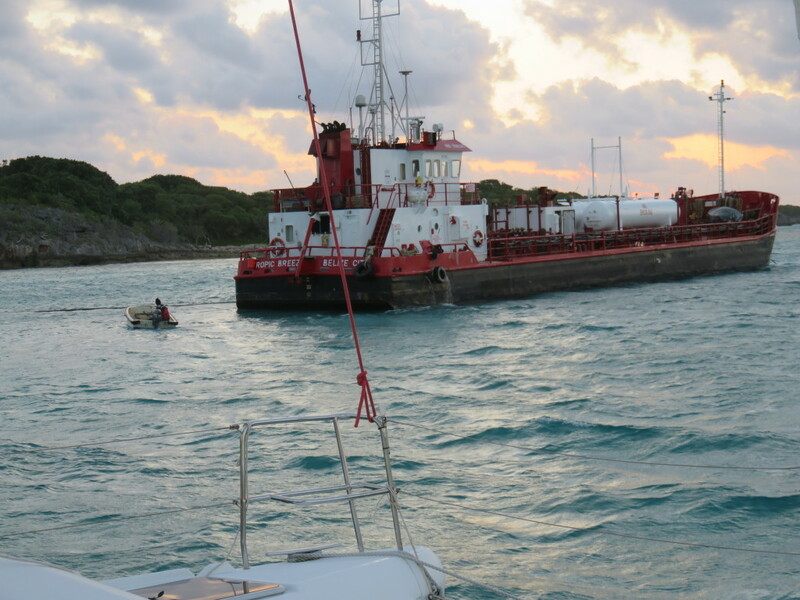 The diver brought a large fuel hose from the tanker to the shore and for several hours fuel was pumped into the Cave Cay tanks. 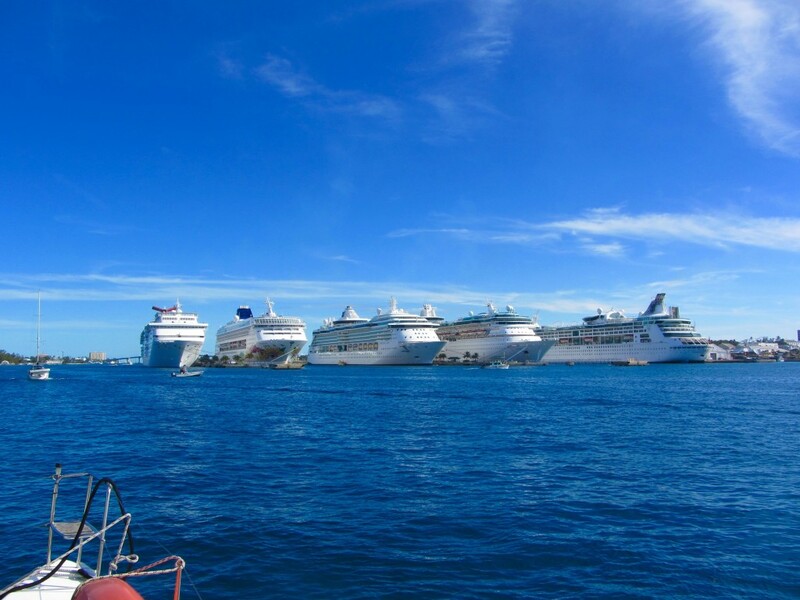 We weren’t worried about the “close call” because we have seen these Bahamian ships often and their captains are very good at maneuvering in tight spaces. The reason the ship went around us was to get downwind so they wouldn’t be blown into us. 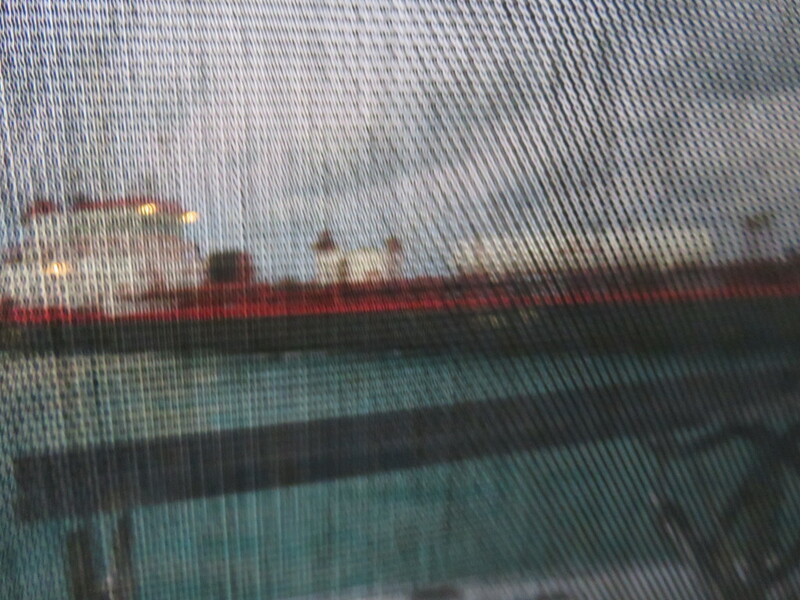 However, we were surprised that this was a marked anchorage on the Explorer Charts but there was no indication that tankers would come here to transfer fuel to the cay. We have anchored here before but this was our first close encounter with a big ship. The fuel hose is visible floating in the water in front of the small boat. Sailor seems to be a bit amazed at what he just saw. 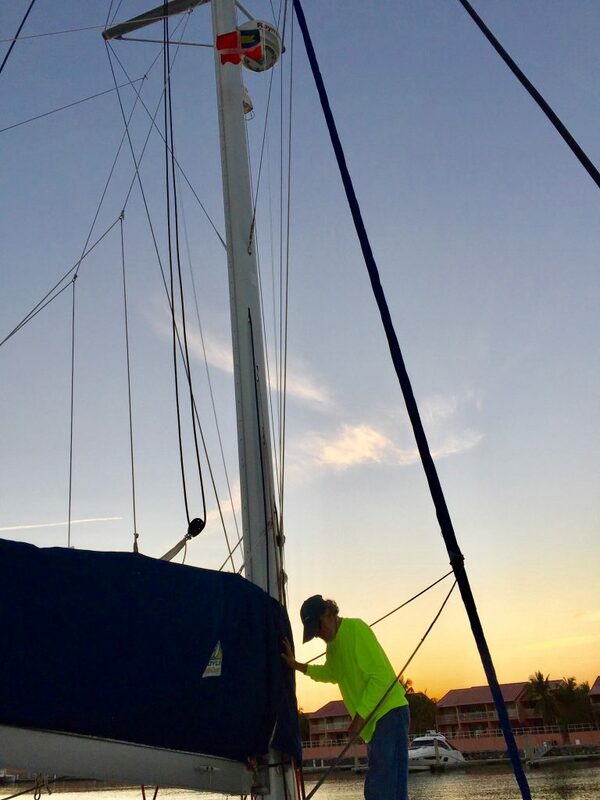 For the next two days, all was quiet in our anchorage, mainly because we were the only boat there, and by January 16 the sky was clear, seas were 2-3 ft, and winds were from the southwest at 8-12 kts. It was time for the last leg of our journey to Georgetown. 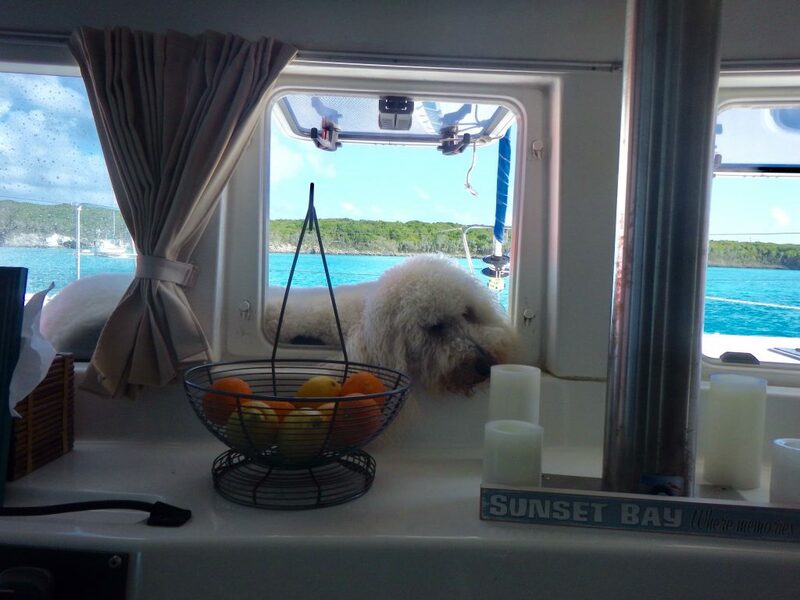 Even Sailor stayed out in the cockpit all day, which he only does when it is very calm. Otherwise he insists I get in one of the beds with him where he feels safe. We left at 0730 and were on our mooring ball in Hole 2 at Stocking Island, across the harbour from Georgetown, by 1230. There were only two balls left in Hole 2 and a few days after we arrived the last one was taken. We were very happy to reach our destination for the next few months and are looking forward to our stay here until the end of March. This was our view of Exuma Sound on our way south to Georgetown. It is rarely this flat so it was well worth the wait. Sailor was in this position all day long. Entering the turquoise water of Elizabeth Harbour. The city of Georgetown is on the right and Stocking Island is on the left. Finally we are on our mooring ball in Hole 2. This is Hole 2 with Elizabeth Harbour and Georgetown in the background, We are at the far end of the mooring field, protected on all four sides with a narrow channel running in the foreground of the picture from Hole 1 through to Hole 3. 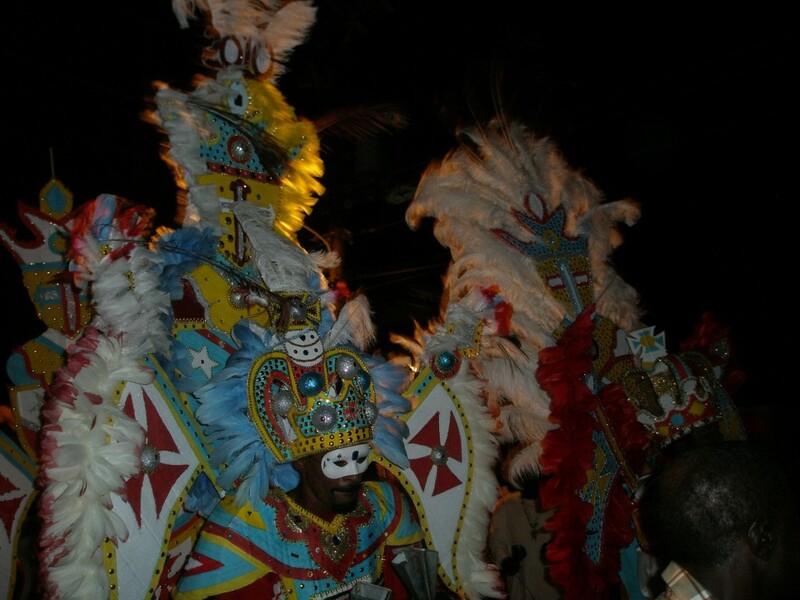 This entry was posted in 2015-2016 Bahamas Cruise and tagged Bahamas, Big Majors, Cave Cay, Chub Cay, Exumas, Fraziers Hog Cay, Georgetown, Nassau, Normans Cay, Staniel Cay on February 9, 2016 by Jan.